Did you know it’s northern springtime on Pluto right now? Pluto is far from a cold lump of rock we were told about in school. It’s a dynamic world and has seasons. 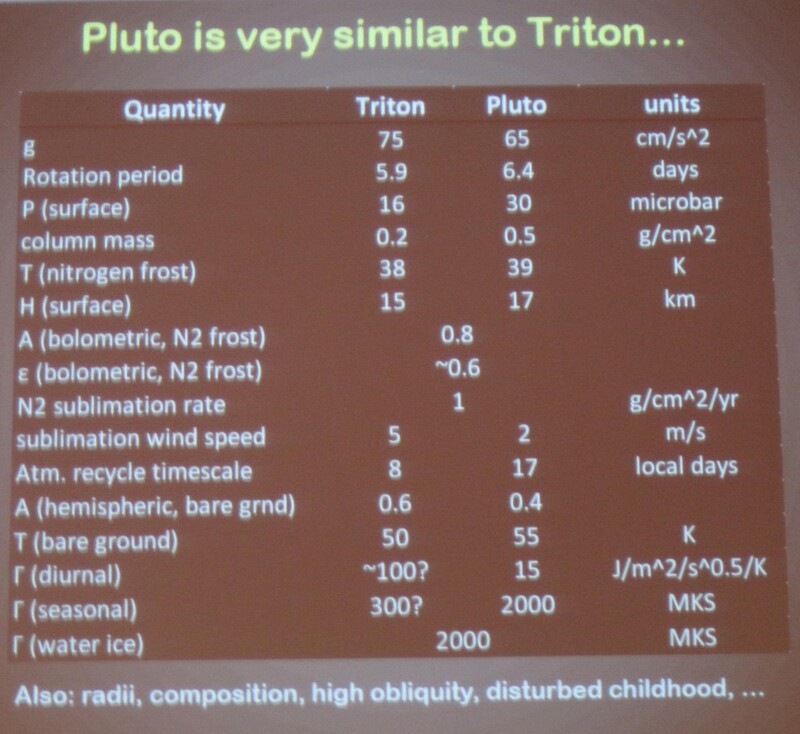 The main properties of Pluto and Neptune’s moon Triton are summarized above. Pluto has a volatile-rich atmosphere (N2, CO, CH4) and interacts with the surface to bring about mass and energy exchange. N2 dominates the surface ices and the atmosphere. N2 is also globally much at the same temperature mainly due to N2’s large latent heat of sublimation that balances out changes in temperature. To probe deeper at surface-atmosphere interactions, he looked specifically at the methane to nitrogen mixing ratio (abundance of one component of a mixture relative to that of all other components). But there are many open mysteries about surface-atmosphere interactions. Overabundance of Methane Mystery. Pluto’s upper atmosphere has X_CH4 ~0.5% (X_CH4 is the methane mixing ratio) based on occultation measurements. Infrared spectral measurements (Jason Cook et al 2007) from the lower atmosphere derive a much higher X_CH4 ~ 4%. Surfaces models for the N2+CH4 ice predict X_CH4 ~0.5%. So in order to explain the overabundance of methane in Pluto’s lower atmosphere, two models were introduced to help provide additional sources of methane. This is an active area of study. Changing Atmospheric Structure. Stepping through the light curve changes shown by Mike Pearson (see previous blog entry) there is something changing the structure of the atmosphere at ~1200 km. Comparing 1988 (equinox) and 2006 (N mid-Spring; Northern ) could be explained partially by geometry changes. Not all the changes are understood. Pluto’s lower atmosphere is a mystery. We can probe down to the stratosphere with occultation measurements (scale height 50 km). So below 50km they need to resort to models. Other influences on surface-atmosphere interaction included effects due to topography and winds. Winds have been observed on Triton (Hansen et al 1990). Predictions for New Horizons. X_CH4 will be ~0.5% in stratosphere, a few % in troposphere. For the atmosphere structure he predicts r_tropopause = 1185 km, h_tropopause = 10km, r_atmosphere_base = 1200km, weak inversion, and bottom of atmosphere at r=1175 km, pressure at surface > 15 microbar. Winds will be Triton-like. A bright north polar cap. Potentially morning frosts. Bonnie Buratti (JPL) presented a talk on “Pluto’s Light Curve over Time as an Indication of Seasonal Volatile Transport.” They are looking at historical light curves, plus new ones and fit with a fixed frost model. Changes in light curves tell you about the albedo (reflectance) of the surface. You do need to do a correction to phase angle because of Pluto’s high obliquity. They do find the data over 2012-2013 consistent with a constant frost model. She showed the data of long-term monitoring of Triton and it indicated a volatile change and they got HST imaging data which when compared with the Voyager fly-by they did see that areas of high albedo got dark and others got brighter, supporting their interpretation of the light curve approach. They really need to get a good light curve prior to New Horizons’ 2015 fly-by encounter. Erin George (University of Colorado), working with Marc Buie (SwRI) in “Pluto Light Curve in 2010,” described her work in analyzing data from Lowell Observatory over 2007-2013. The challenge had been to find stars to use as relative flux calibrators that were well separated. They also used a technique to remove the template of background stars (eliminate field confusion). Marc Buie (SwRI) next took us on a tour of “Seasonal Variations on the Surface of Pluto.” He reports on visible (B & V filters) photometry from data taken with photographic plate, photoelectric detectors, and CCDs from 1954-2010. All the measurements are of “Pluto+Charon” as the two bodies are not resolved from the ground for the majority of this data (large pixels). He showed the trend of the light curve which indicates that “something happened in 1992” (he hypothesizes it occurred very fast) to change the “color” of Pluto because the light curves in B & V passbands deviate. He’s working towards removing Charon from the data using a model for its brightness from his HST data. Leslie Young (SwRI) presented a talk on “Modeling Pluto’s Diurnal and Seasonal 3-Dimensional Volatile Transport with VT3D. ” She asks, “Why should we care about volatile transport?” Three key reasons: (1) Mobile volatiles control the surface appearance (albedo, composition), (2) Volatile transport depends on the hidden subsurface (thermal properties, depth of volatile deposits), and (3) Volatile transport models can predict atmospheric behavior at other times (escape rates, atmospheric chemistry, winds). Her new code, VT3D, uses physics from standard volatile transport models (Hansen & Paige, Spencer & Moore). She has been validating it against other codes. Types of parameters that she investigated in her code are emissivities, thermal inertia, albedo, and nitrogen abundances. She found her results clumped into three categories, atmospheres characterized by: (1) Permanent Northern Volatiles, (2) Exchange with Pressure Plateau, and (3) Exchange with Early Collapse. A description of her model can be found in L. Young (2013) http://arxiv.org/abs/1210.7778. Her model fails to predict a bright south pole seen in the 1990-1994. But then she counters, could that be possible because it’s covered with bright CH4 frost? 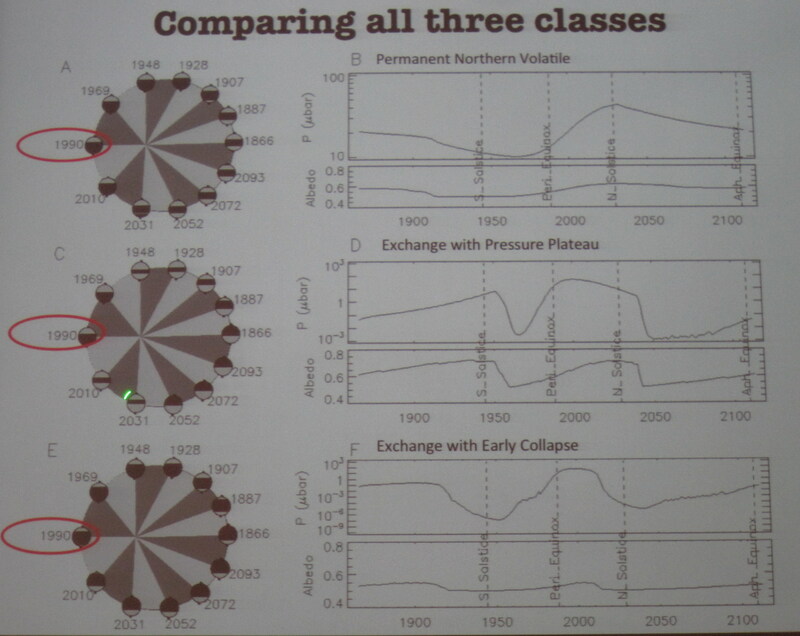 Three classes of atmosphere models from Leslie Young (2013). The graphs are the surface albedo and the pressure at 1175km in u=microbars vs. time. The time runs from 1866 to 2116, a full Pluto year about the Sun. The seasons on Pluto are shown with the vertical lines and the equinox in 1990 is highlight with the circle. To learn more about Pluto’s seasons check out this blog from the Planetary Society http://www.planetary.org/blogs/emily-lakdawalla/2013/05021212-plutos-seasons-new-horizons.html. 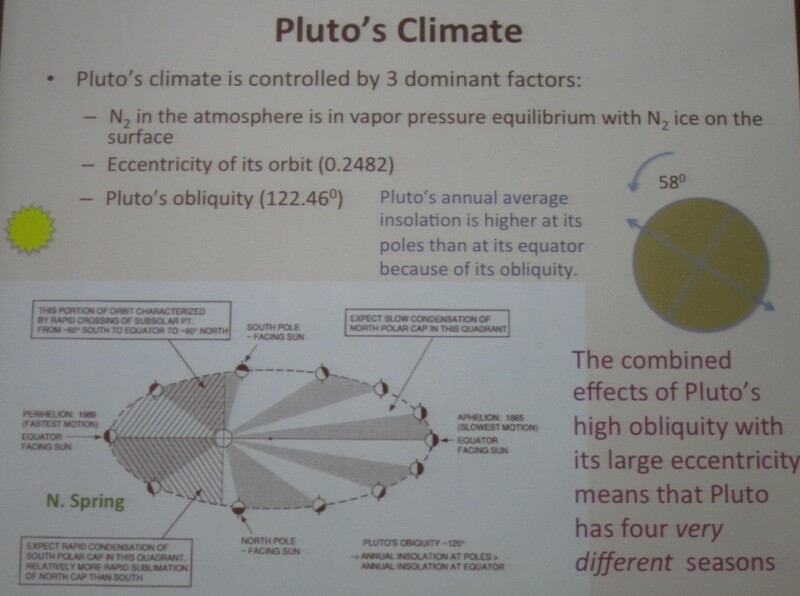 Candy Hansen (PSI) described her model in her talk entitled “Pluto’s Climate Modeled with New Observational Constraints.” She described her model, HP96, named after Candy Hansen and her collaborator Dave Paige, which was coded in 1996. She showed an output of the model for Pluto from 1000 to 2100 AD, over a good four Pluto-orbits about the sun. The model now has been updated to address new knowledge learned about the Pluto system. To derive solutions that do not have a zonal band (an observable characterized by sharing a range of latitude, appearing as a ‘band’), eliminates high thermal inertia cases, cold frosts and large abundances of N2. The model does meet constraints from the observed albedo. She does not include an atmosphere in her model, so she is excluding wind and other atmosphere layer issues. After seeing the data from the May 2013 occultation presented at this meeting on Tuesday made her change her models and she presented a true “hot off the press” new result today. Predictions for New Horizons. 2.4 Pascals at the surface at the time of the New Horizons fly-by. As a closing comment during the discussion session, Rick Binzel is hopeful that Charon-illuminated image of Pluto’s south pole during the New Horizons fly by will be a key to helping understand what may be going on at Pluto’s south pole! A nice summary of seasons of Pluto. Since the 1950s we are seeing more of Pluto’s northern hemisphere. We are in Pluto’s northern spring time right now. Laurence Trafton (University of Texas) gave a talk on “Driving Seasonal Sublimation and Deposition on Pluto-Uncertainties in Evaluating the Vapor Pressure.” Pluto’s atmosphere is supported by the vapor pressure of its surface ice. For most models, N2, CH4, and CO are assumed to exist solely in solid solution on Pluto’s surface, and are well mixed in atmosphere. However, this did not explain the mystery of Pluto’s elevated atmosphere CH4 amounts (see above talk by Stansberry). Two models were suggested: “Detailed balancing model” (DBM) (Trafton 1990) and the “Hot CH4 Patch Model” (Stansberry et al 1996). The latter only needs 1-3% of Pluto’s surface to have this extra source of CH4. Neither model can explain widespread pure CH4 ice hypothesized to be on Pluto’s surface. He is in need of lab experiments to establish vapor pressures for the saturated areas of the phase diagram. Tim Michaels (SETI) spoke about “Global Surface Atmosphere Interactions on Pluto. ” He is using the OLAM (Ocean Land Atmosphere Model, Wakko and Avissar, 2008) model. He is using the Northern summer in 21st century convention (which is the IAU/Ecliptic North coordinate system). Their approach stats with a simple surface nitrogen ice model (no methane). When run for 1990 and 2015, they show distinctly different trends. Next steps are to add albedo distribution, methane cycle, and gravity changes. This is a rich atmosphere-surface system. Kevin Baines (University of Wisconsin-Madison) spoke about “Chemistry in Pluto’s Atmosphere and Surface: Predictions of Trace Aerosol and Surface Composition, and a Potential Geologic Chronometer.” There are many sources that drive atmosphere surface chemistry and albedo. For example, volatile transport dominates on days, months, and year timescales. There is UV photochemistry (decade timescale) in this rich atmosphere. Hydrocarbons could be raining out 1mm every 50,000 years. Solar wind and accretion activities (impacts, dust from satellites or KBOs) occur in 1Myr timescales. So, he asked, “What would Galactic Cosmic Rays (GCR) do?“ The types of products by irradiation from CGRs include CH4, CnH2n+2, C6H10, NH3, HCN, etc. over 5-20 Myr. And he proposes they may be viewable by darkening on airless KBOs. 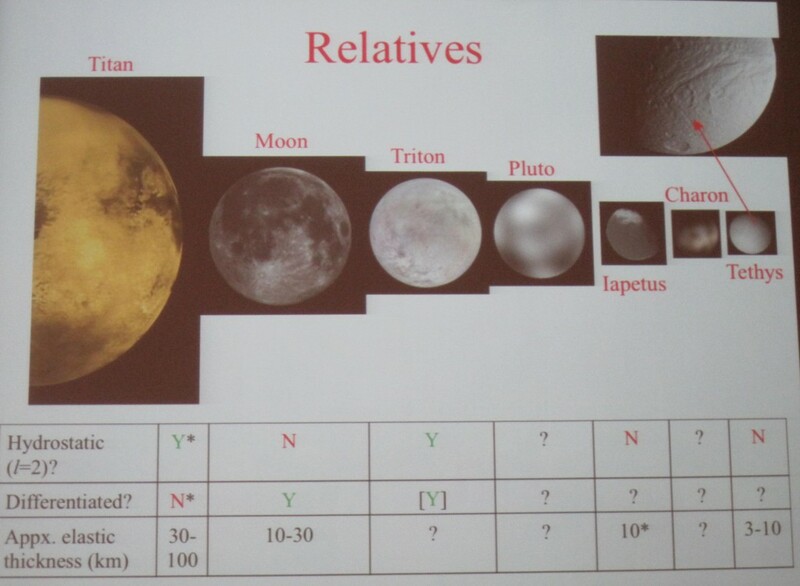 Vladimir Krasnopolsky spoke on “Pluto’s Photochemistry: Comparison with Titan and Triton.” There are three bodies with N2/CH4 atmospheres in the solar system: Titan (moon of Saturn), Triton (moon of Neptune), and Pluto. He proposes that Titan is a better analog to Pluto rather than Triton. 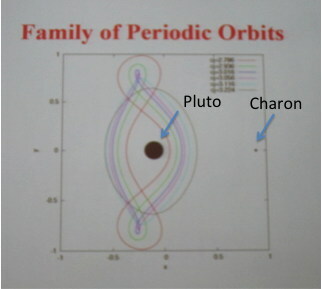 He presented the main results of his Pluto Model (Krasnopolsky & Cruikshank 1999). He observed Pluto with HST in the UV 180-256nm and was able to fit molecular species predicted by his model and saw no albedo changes from his predictions (Krasnopolsky 2001). New Horizons data will provide useful information to update their photochemical model. Francois Forget (CNRS, Paris, France) closed the day with “3D Modeling of the Methane Cycle on Pluto). He presented the LMD Pluto Global climate model. Their model does include the methane cycle, but they are neglecting microphysics of N2-CH4. They assume the terrain description of Pluto from Lellouch et al 2000 (areas of N2 Ice, CH4-rich areas and dark albedo areas due to tholins). They ran the model starting from 1988 and the model has a resolution of 170km. The model predicts an observable X_CH4 of 0.35% and this in the agreement of the ~0.5% from observational data by Lellouch et al (2011). The models predict methane cloud formation at the pole and that could be matching observed data from J. Cook who understanding his methane detection comes form cold parts of the atmosphere. He presented a model for cloud formation for 2015 and clouds do appear in the low, colder parts of the atmosphere. Their model will be made available to the community to use. They do not have a cold troposphere in their model. Prediction for New Horizons. More CH4 ice deposits at the summer pole in 2015 than in 2010. Who’d have known that that little cold world out there in deep, dark space, would have such a fascinating trip around the Sun? Data from New Horizons from its July 2015 fly-by of the Pluto System will literally confirm or refute all of these predictions. Then the models can be updated to reflect what summer will be like on Pluto in 2240. Author Kimberly EnnicoPosted on July 26, 2013 July 31, 2013 Tags NASA, New Horizons, PlutoLeave a comment on Did you know it’s northern springtime on Pluto right now? Pluto is far from a cold lump of rock we were told about in school. It’s a dynamic world and has seasons. Today: Geology of unmapped worlds. 2015: Pluto will never be the same as New Horizons brings you a Pluto, Charon, Nix, Hydra, Kerberos, and Styx, in ways never seen before. This a blog entry for a series about the Pluto Science Conference being held at JHU’s APL in Laurel, MD, July 22-26, 2013. This entry summaries surface geology talks presented on July 25th. Paul Schenk (LPI) began the session with his talk entitled “The Improbable Art of Predicting Pluto-Charon Geology.” Thanks to Voyager, Galileo and Cassini we have a wealth of knowledge about icy bodies in the solar system. However, in comparison to the icy satellites about Saturn, the Pluto-Charon bodies are expected to have key differences: volatile ice content is probably higher, their geological histories are not influenced by the existence of large giant planet near by (tidal forces), etc. He next stepped up through the key geological processes that would alter and/or create surface features. For example, volcanism creates smooth plains, calderas, vents, ridges, and active venting. Volcanic processes have been seen on many icy moons. There is diapirisim, a type of solid-state resurfacing due vertical ice movement. To have this process, you need an ice shell, preferably a thin shell with a source of heat. This is seen only two icy bodies in the solar system: Triton (“cantaloupe terrain”) and Europa (domes, spots). There is also tectonism, revealed through fractures. Vertical movement is one of the processes creating unique features on Triton & Europa. The Earth shows this behavior (described above, called diapirism) in local regions of salt deposits. He next pointed out the possibility that satellites could have rings too. For example, there is a giant ridge on Iapetus (Ip 2007) and a similar feature on Rhea (Schenk et al 2011). It is hypothesized that these surface features were the result of a ring that had collapsed onto the surface. His advice to the New Horizons team is to pay special attention to the Pluto-Charon equatorial regions to look for a ring-remnant. Impact Cratering tells us about the impactor population that are “fluxing into the system,” reveals surface stratigraphy, reveals interior stratigraphy (what the underlying layers look like), and reveal thermal history. Counting crater impacts on Pluto & Charon will be used to evaluate the Kuiper Belt population. What about viscous relaxed craters? They have been found on Ganymede & Enceladus. Crater shapes can be used to reveal the properties about the object. However, he added this caveat that all previous work on modeling crater shapes was on water ice dominated surfaces, not methane (which is expected on Pluto), so more lab work is needed. Basin morphologies are important too. They tell us about evolution. Anomalous morphologies are also a key thing to look for on Pluto & Charon. The Tyre crater on Europa (one of Jupiter’s moons) from http://www.lpi.usra.edu/science/kiefer/Education/SSRG2-Craters/europa_tyre.jpg. Europa has these intriguing multi-ring systems, such as shown above with the image of Tyre crater. The hypothesis is that on Europa we are seeing an impact penetrating into the ice shell of 10-20 km. Crater falls in on its self, creating this ringed structure. Geoffrey Collins (Wheaton College) “Predictions about Tectonics on Pluto and Charon.” His premise: “Tides raised by giant planets appear to be an important factor in icy satellite tectonics, but what about the Kuiper Belt?” He is interested in the time period after the initial Charon-forming impact. He and his colleagues have created models to calculate the interior viscosity for a range of Charon’s orbital evolution scenarios. They looked at the three main possible interior models for Pluto: (1) ice shell, ocean, rock core; (2) thick ice shell, rock core; and (3) uniform density. 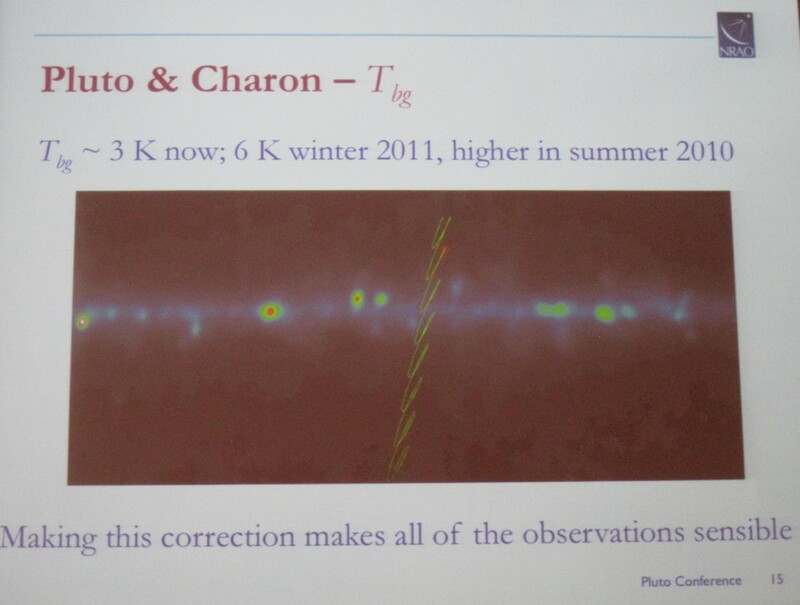 Another parameter they looked at was the formation distance of Charon from Pluto. 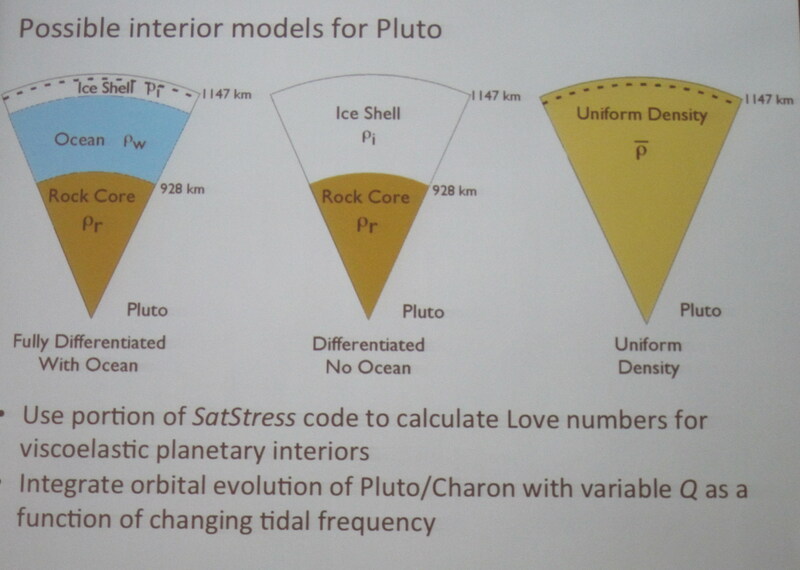 Possible interior models for Pluto are shown above: (left) ice-shell, ocean, core, (middle) thick ice-shell, core, (right) uniform density (undifferentiated). Conclusions. Pluto will need to have an interior > 200 K. It is likely that due to tidal heating (when orbital and rotational energy are dissipated as heat in the crust, which would be happening for Pluto despinning after formation), Pluto would melt and differentiate. The most self-consistent models include an ocean. Beau Bierhaus (SwRI) talked about “Crater and Ejecta Populations on Pluto and its Entourage.” Craters are the most abundant landform in the solar system. They tell us about the target on/in which they reside. By studying the numbers and sizes of craters, and assuming an estimated impact rate, one can use crater density to estimate surface age. They are also indirect indicators of the impactor and in the case of Pluto, this could tell us information about the Kuiper Belt makeup. Mass ejected from a crater follows an inverse relationship with velocity. Less mass is ejected at higher velocities, but to have ejecta (the material thrown out after an impact), the speed has to be above a particular Vmin, minimum velocity. And if that velocity is lower than the escape velocity for an object (the speed above which would allow the object to escape the gravity well and go into orbit), you can create secondary craters. For ice, Vmin ~150-250 m/s. Pluto has Vescape ~1180 m/s; Charon has Vescape ~550 m/s. So we expect to see secondary craters on Pluto & Charon. Sesquinary craters might form when Vmin>> Vescape and the ejecta does escape the surface and then falls back onto its surface or onto another body. These are expected to be rare, but it’s possible you can have a crater formed on Pluto from a secondary ejected from Charon. Predictions for New Horizons. Expect to see secondary craters on Pluto & Charon. 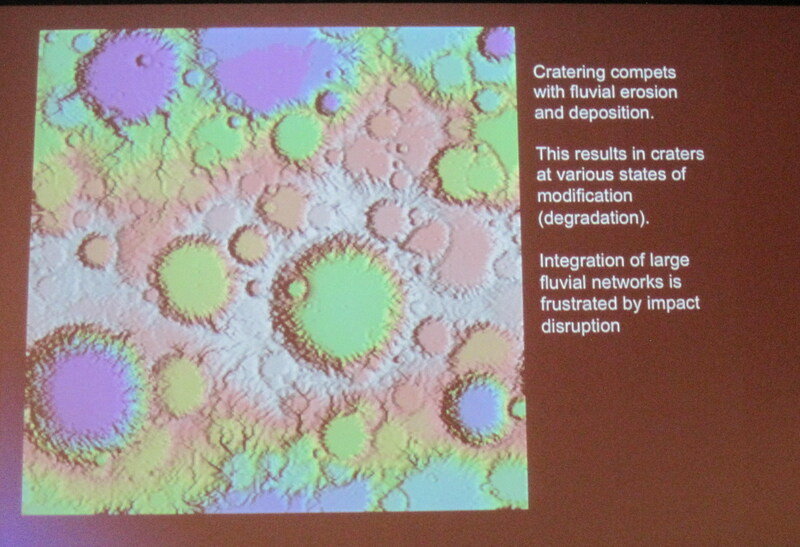 Most of the craters will be primary impacts and they may have unusual morphology due to low impact speeds. Veronica Bray (LPL, Arizona) continued the conversation with her talk on “Impact Crater Morphology on Pluto.” The crater morphology (shape) depends on properties of impactor and also the gravity and surface/subsurface of the receiving body. For Pluto, we expect the crater morphologies to match those expected for impacts to icy bodies: shallow wall slopes, smaller rim heights, and central pit instead of peak-rings. 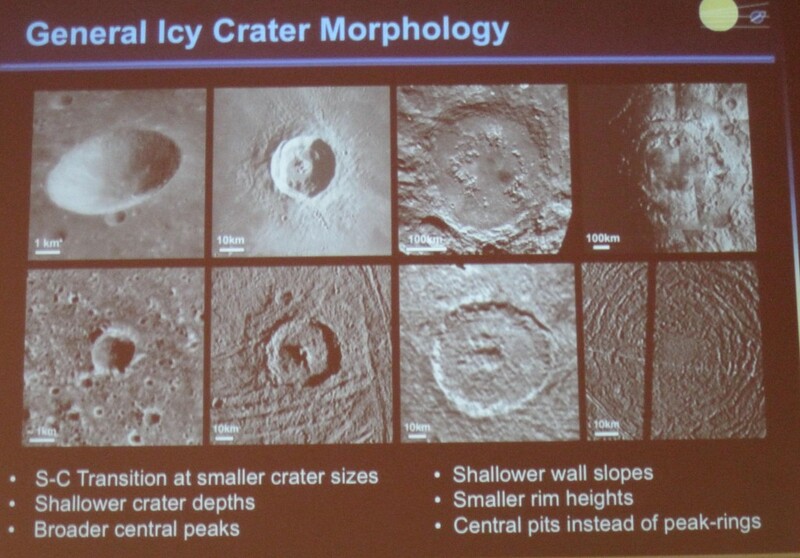 Comparative crater morphology. Top row: Impact Craters on a rocky body (Earth’s Moon). Bottom Row: Impact craters on icy bodies. Left to right indicate increasing crater diameter. The multi-ring basin, shown at the bottom right, is the Tyre crater on Europa, hypothesized to be the remnant of an object that penetrated into the subsurface. Lower impact velocity will provide less impact melt. New Horizons will resolve large and small-scale features. However, with respect to things like Isis-style floor pits, New Horizon’s best resolution is not high enough. What will New Horizons data tell us? New Horizons will address answers to how velocity affects peak development and primary crater depth, central pit formation in relation to melt drainage, and the d/D (depth to Diameter) trend to address heat flow models over time. Olivier Barnoiun (JHU/APL) talk was entitled “Surfaces Processes on the Moons of Pluto: Investigating the Effects of Gravity.” He is interested in processes on the smaller Pluto moons: Nix, Hydra, Kerberos, and Styx. He identified analogies in the solar system like 25413 Itokawa, a 100m asteroid that had been imaged by JAXA’s Hayabusa spacecraft in 2005. Hayabusa’s images revealed boulders that clustered together and were aligned; the leading hypothesis is that they were placed there by motion due to gravity. Other processes due to the presence of gravity, such as slope motions, are seen in the images. He notes that New Horizons will not have the resolution to duplicate the resolution Hayabusa had on Itokawa. He and his colleagues have developed a computation “plate model” approach to tackle the motion of surface objects caused by “acceleration due to gravity” and this can be applicable to non-spherical bodies, for which Pluto’s smaller moons are highly suspected to be. Marc Neveu (Arizona State University) asked “Exotic Sodas: Can Gas Exsolution Drive Explosive Cryovolcanism on Pluto and Charon?” Charon’s surface looks geologically young and could have an environment suitable for cryovolcanism. The term cryovolcanism was coined to explain the condition where the volcano erupts volatiles such as water, ammonia or methane, instead of molten rock . He presented a geochemical model where he has gas exiting a liquid as the mechanism for the cryovolcanism. 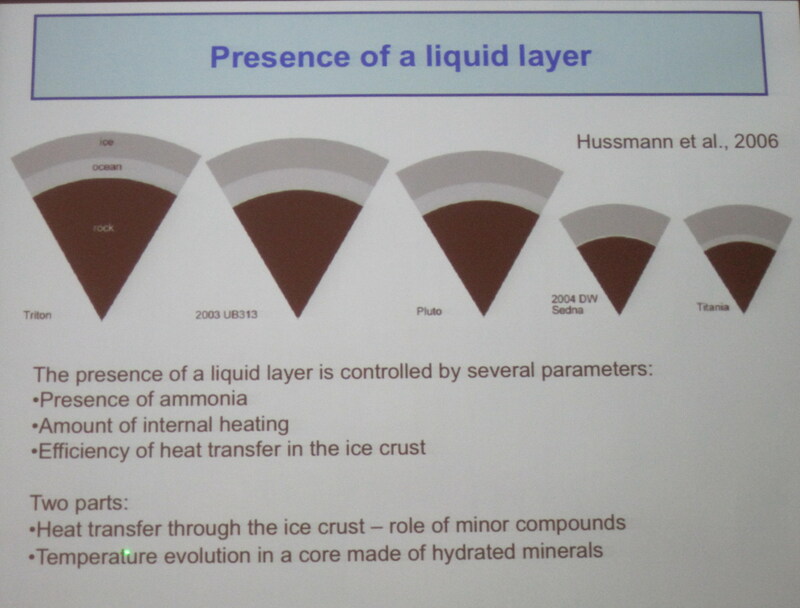 The model involves the host liquid with different gas materials added and requires a crack in the surface ice layer. They also applied their model for a object that has a top crust; the crust acts like a “pressure seal” and prevents the gas from exsolving (separating from the liquid). Lynnae Quick (JHU) presented some additional unique physics at Pluto with her talk on “Predictions for Cryovolcanic Flows on the Surface of Pluto.” She started with the statement that candidate bodies where cryovolcanism may be taking place are Enceladus, Europa, Titan and Triton. Imaging data from Voyager 2’s flyby of Neptune’s moon Triton provides strong evidence of cryovolcanism through interpretations of the terrain characterized by a lack of craters, geyser-like plume, walled plains, ring paterae (smooth circular), pit paterae, guttae (drop features). She and her colleagues are modeling the cooling of (surface) lava flows and used a variety of “candidate lava compositions,” mixtures of H2O, NH3, CH3OH, CO, CH4, N2 ices. They compute cooling time for variety of lava thicknesses and compositions. Predictions for Plutonian Lavas. Their work suggests N2-CO and/or N2-CH4 lavas could have 62-68 K melting temperatures, so essentially they could stay “molten” on Pluto for long duration. They will need high-resolution topography of Pluto, Triton, and Io, lab data for 50-273 K and New Horizons imagery of Pluto data to advance their models. Alan Howard (University of Virginia) spoke about “Landforms and Surface Processes on Pluto and Charon. ” He walked us through multiple ways to add and subtract material from a surface: Accrescenence is the addition (e.g., condensation) of material normal to the surfaces, resulting in outward facing surfaces getting rounded and inward faces surfaces being sharpened. Decrescence is the removal (e.g., sublimation) of material normal from the surface, resulting in the outward facing surfaces being sharpened, and inward faces getting smoothed. Mass wasting is the bulk movement of material downslope aided by gravity (e.g. avalanches, debris flow, landslides). Gas Geysers are caused when solar energy hits ice, heating the underlying surface that then expands and erupts through the surface. Aeolian (wind) processes form things like sand dunes. To address this complex series of multiple surface activities, landscape evolution models have been developed to model such these processes with time. Result of a landscape evolution mode. Shown here is one result where large fluvial (flow) networks tend to get disrupted when you have a lot of impacting events. Predictions for New Horizons. Expect to see scarps (steep banks) on the surface of Pluto. Expect to see the unexpected on Pluto and Charon. Timothy Titus (USGS) gave a thought-provoking talk about using the “Mars Seasonal Caps as an Analog for Pluto: Jets, Fans, and Cold Trapping.” His premise is that the Mars’ polar processes are suitable analogs to explain what may be happening on Pluto. He stepped us through the Mars polar volatile transport model. A key item is thermal inertia. On Mars the soil absorbs heat in summer, but high enough thermal inertia (200 MKS) to delay ice formation until late in the year, and this, as you would expect, affect the whole ‘ice cycle.’ There is a big disconnect in the community over what Pluto’s thermal inertia is. In E. Lellouch’s talk on Jul 23 (see earlier blog entry) he reported that Spitzer & Herschel have measured Pluto’s thermal inertia as 20-30 MKS (Lellouch et al 2011). However, Pluto atmosphere pressure models needed to match occultation by C. Olkin & L. Young require Pluto have a much higher thermal inertia >1000 MKS to explain their occultation measurements (presented at this meeting). He makes a tantalizing comparison between the north/south asymmetry in the Mars polar ice caps due to topography and suggests whether this could possibly be an analog to why the methane and N2 have longitudinal distributions (shown yesterday in Will Grundy’s talk). Jets, plumes, fans, and spiders on Mars are results of active gas geyser activities. He postulates, could the same be occurring on Pluto? If we miss the gas/plume season, we could see the leftover signatures in fans and spiders. Predictions for New Horizons. Asymmetric seasonal caps. Methane lags surrounding the N2 seasonal cap. Optically thick layers of methane on top of N2 ice. Solid green house gas jets or at least spiders and fans. David Williams (Arizona State University) talked about “Using Geologic Mapping as a Tool to Investigate the Geologic Histories of Pluto and its Satellites.” Geologic mapping documents the main geologic units and features and their relative ages and other characteristics. This is an iterative process using greyscale images, topographic data, and compositional and spectral data. They also identify structural features (crater rims, ridges, toughs, graben, lineaments, scarps, pits, etc.) They can use crater model ages to define a model-derived stratigraphy. The Geologic Information Software (GIS) is used to make the maps. Geologic maps are being made of the Moon, Jupiter system, Saturn system, Mercury, etc. from orbiter data. Data from fly-by missions have been used to make maps, such as Mariner 10 (Mercury), Voyager-Galileo (Galilean satellites), Cassini RADR (Titan). There will be a challenge of the vastly changing resolution data sets from the New Horizons flyby, but they would like to make these maps. John Spencer (SwRI) ended the session with “What will Pluto Look Like?” He began, “Will Pluto Look like Triton?” And his answer: Geologically, Yes. He does not expect to see lots of craters. He expects that Pluto will have a surface that is as young and geologically active as Triton’s. One of the surprising thing about Triton’s surface is that it is lightly cratered. Are we seeing a situation where Triton had been completely resurfaced a lot since its capture by Neptune? And it should also have sufficient internal heating from radiogenic heating (radioactive decay from rock) rather than rely on Neptune to provide resurfacing mechanisms. When looking at albedo (reflectance) contrasts between Triton (Voyager 1989) vs. Pluto (HST data 2004), you see factors of 10 across short distances on both bodies. 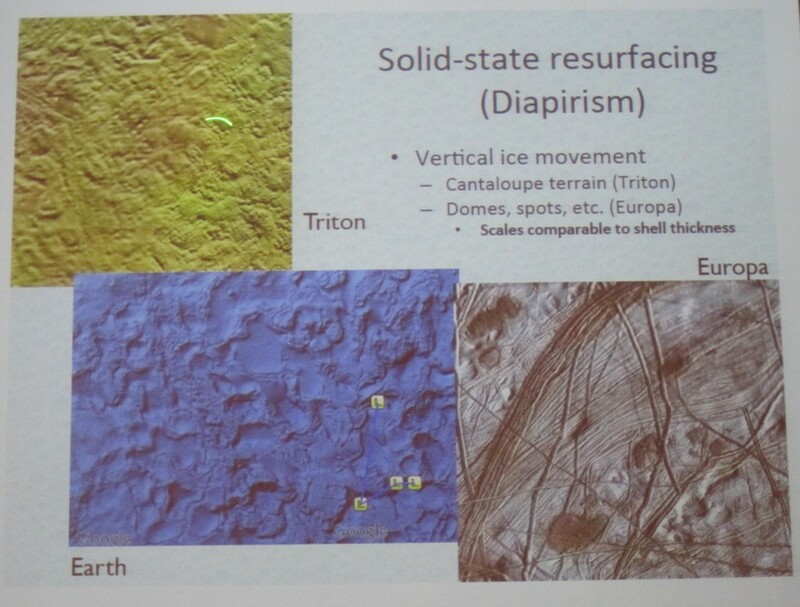 Non-volatile surfaces on Triton are “bright” explained as H2O and CO2 exposed. However non-volatile surfaces on Pluto are “dark” explained as H20 and CO2 buried by dark material. So Pluto will not look compositionally like Triton. John Spencer then drew our attention to Iapetus, a moon of Saturn, that also has a range of albedos, dark to light, with the hypothesis being an “exogenic trigger” and was suggestive of an analog there. In answering a question about a prediction for topography, the discussion led to Paul Schenk (who spoke earlier) suggesting that Charon would look pretty flat (like Triton), with +/- 1km range. Bill McKinnon reminded us that Iapetus is an example of a body with extreme topography, ~ +/- 15km. After such a visualizing intriguing morning, one thing can be certain: Pluto and Charon surfaces will have an impact (pun intended!) on our understanding the nature of icy bodies in our solar system. Author Kimberly EnnicoPosted on July 26, 2013 July 31, 2013 Tags Geology, Imagery, NASA, New Horizons, PlutoLeave a comment on Today: Geology of unmapped worlds. 2015: Pluto will never be the same as New Horizons brings you a Pluto, Charon, Nix, Hydra, Kerberos, and Styx, in ways never seen before. It’s more than skin deep. Interiors of Pluto and Charon, a Discussion. This entry is a summary of talks presented at the Interiors session July 24th, 2013, during the Pluto Science Conference in Laurel, MD being held this week July 22-26, 2013. Christophe Sotin (JPL) began the session with a talk entitled “Processes involved in the evolution of Pluto’s interior Structure.” He started his talk with a comparison of model of the interiors of Ceres, Callisto, Enceladus, Pluto (McCord & Sotin, 2005; McKinnon & Mueller, 1986; and Simonelli & Reynolds 1989). More recent models propose the existence of a liquid layer between an icy surface and a rocky core (Hussman et al 2006). This layer of liquid changes the way heat is transferred to the ice crust. If liquid methane could form at the base of the ice layer, forming a “sub surface ocean”, it would react with water and form stable methane clathrates. The presence and thickness of the “clathrate layer” affects the thickness of the ice crust above it. Conclusions. In their interior models, minor components (e.g. NH3) play important roles in both the characteristics (e.g. thickness) and dynamics of the ice crust. They need laboratory experiments to study the relative stability of the clathrate hydrates. Hydrated silicates (e.g. antigorite) are likely to be the make-up of the Pluto core. It will undergo dehydration some 100 Myrs to Gyrs after accretion. Convection within the core. The presence of a subsurface ocean depends on the presence of minor components. The term clathrate is used to describe a structure that consisting of a lattice that traps or contains molecules. Shape is Important. Shape tells us whether a body responds like a fluid. If the body behaves like a fluid (i.e., behaves hydrostatically), you can compute the moment of inertia. This, in turn can tells us something about the interior (i.e., is it differentiated or not). There is a caveat that differentiation can also occur due to radioactive decay. Differentiation happens when ice melts, so it tells us about thermal evolution. Comparative study of other bodies in the outer solar system and what we know about their interiors. Evolution of Shapes. Early on, Pluto & Charon are rotating quickly, and are distorted. Pluto and Charon change shapes in the first few to 100 Myr if fluid or elastic, respectively, as their spin rate slows down and Charon moves outward. The spin rates influence their shapes. What leads to Oceans? A conductive (no convection) ice shell is required to make an ocean (Desch et al 2009). This shell basically lets the heat out from the core. This heating then melts the bottom of the ice shell creating an ocean. The presence of an ocean changes the stress history. In the creation of an ocean, you are replacing low-density ice with higher density water and this introduces compression stresses. If you see things like the Tyre crater on Jupiter’s moon Europa, a multi-ring impact that implies there was an ocean. Whether or not an ocean is present has important astrobiology & geophysics consequences. If you introduce an ocean, you never have a fossil bulge. If you do not have an ocean, you could get a fossil bulge. A fossil bulge is a bulge that froze into shape before the satellite synchronized its rotation. Martin Paetzold (Universitat zu Koln, Germany) spoke about “Mass Determination of Pluto and Charon from NH’s REX Radio Science Observation.” During the fly-by, Pluto will perturb the New Horizons spacecraft velocity just slightly and this will be recorded as a tiny Doppler shift of the X-band (8.4 GHz) radio carrier frequency. This information will be used to measure the mass, or more specifically, the product GM (universal gravity constant times the mass), of Pluto. There are two different ways to obtain this data during the New Horizons mission: (1) Using two-way ranging a week before the encounter and week after the encounter, and (2) During the encounter, the REX uplink instrument (operating at 7.1 GHz) will have a series of measurements during the days around closest approach. They hope to obtain 0.15% accuracy for the first method and 0.04% for the second method. The best results utilize both methods potentially deriving an estimate of Pluto & Charon masses with an accuracy of 0.01%. They are currently looking at the small forces file, which is the measure of the attitude performance during thruster firing. James Roberts (JHU/APL) spoke about “Tidal Constraints on the Interiors of Pluto and Charon.” Thermal evolution of Pluto & Charon is a key question for scientists to answer. But thermal models are dependent on interior structure. At present we do not know whether Pluto or Charon are homogeneous (i.e. same material throughout) or differentiated (split into a core and crust, or maybe core, subsurface ocean and crust). Typical methods used to probe interiors are Kepler’s 3rd Law, Bulk density, Moment of Inertia, Gravity, Magnetism, Radar, Seismology, Tides. For New Horizons, as the fly-by is not that close, Gravity is not a viable method; the lack of a magnetometer aboard rules out Magnetism, and Seismology requires the spacecraft to land, also not possible. He described their approach that will use Shape Modeling to measure a Tidal Bulge. Both Pluto and Charon may each raise a tidal bulge on the other. He cautioned that we may not be able to determined the existence of an ocean using a shape model. Steve Desch (Arizona State University) spoke on “Using Charon’s Density to Constrain Models of the Formation of the Pluto System.” The unique Pluto-Charon system has been modeled as arising from the impact of two large Kuiper Belt Objects (KBOs). This had been presented on July 23rd by Robin Canup. Steve Desch’s model takes two differentiated KBO bodies (but they must have a thick crust) in a disk and collides them. Parts from the bodies’ inner core, plus some ice, forms Pluto and the outer icy mantles form Charon & the other moons. 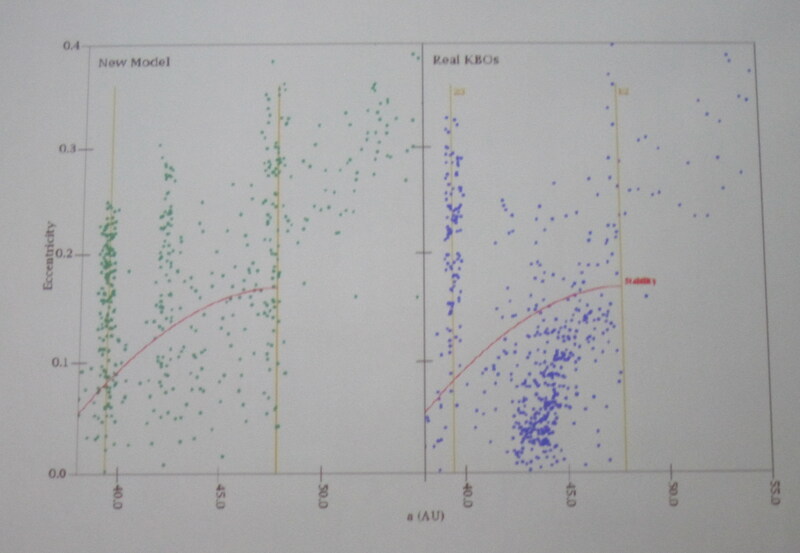 He addressed that the initial differentiated KBOs with r=600-1200 km could exist (Desch et al 2009, Rubin et al 2013). The outcomes of this model create a dense Charon (density= 1.63 g/cm3) because Charon would have been formed from the outer regions of the initial KBOs, and those objects are characterized with thick crusts. This is the alternative model that was not preferred by Robin Canup in her talk yesterday. This remains an active area of study. Wrapping up this 3rd day of a dynamic conference we learned that we still have a lot more questions about the formation and the interior or Pluto, Charon or any of these icy bodies in the Outer Solar System. New Horizons will indeed bring an revolutionary dataset to allow to direct investigation of surface features, overall shapes, masses, and orbital dynamics, all which will constrain models of what these bodies are made of and how they formed. Author Kimberly EnnicoPosted on July 26, 2013 July 31, 2013 Tags NASA, New Horizons, PlutoLeave a comment on It’s more than skin deep. Interiors of Pluto and Charon, a Discussion. Some insights into Charon and what roles laboratory work can play in New Horizons science. These are talk summaries from the afternoon of July 24th at the Pluto Science Conference being held this week, July 22-26, 2013 at the Johns Hopkins University Applied Physics Lab in Laurel, MD. 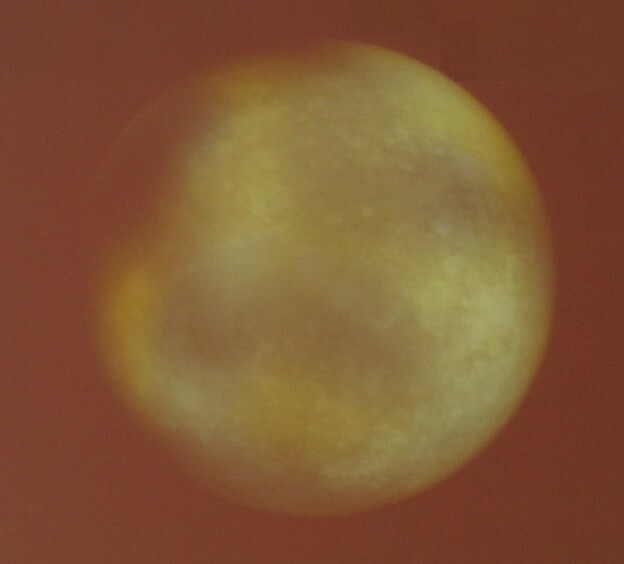 Marc Buie (SwRI) walked us through “The Surface of Charon.” Charon was detected by Jim Christy in April 1978, in what were originally dubbed “bad images” from the Naval Observatory, but not confirmed as a satellite by the IAU until February 1985. Charon is about 1 arcsecond from and ~1.5x mag fainter than Pluto. An occultation measurement in April 1980 confirmed the detection. “Mutual Event Season” is when every half orbit of Charon passes in front or behind Pluto. This occurred over 1985-1990 time frame. For the specific orientation where “Charon went behind Pluto,” as observed from Earth, you can directly measure’s Charon’s albedo, the size ratio between Pluto and Charon and start deriving its composition. So, work in earnest to determine Charon’s surface started in the mid-1980s. 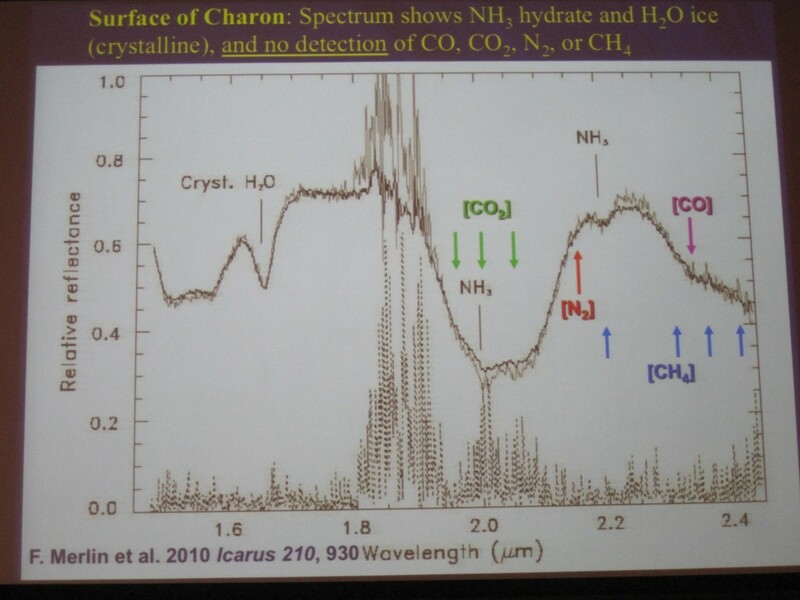 In 1987, Marc Buie and his colleagues got IR spectra using a single-channel detector and a circular variable filter, the best in spectrographs at the time, and this revealed Pluto’s atmosphere is methane dominated and Charon’s atmosphere is water dominated, and they do not look like each other. Hubble Space Telescope (HST) entered the scene and a series of observations of Pluto and Charon with HST started in 1992. The first rotational light curve of Charon was obtained in 1992-1993, indicating a 8% variation in the brightness, much smaller than that for Pluto and the data also confirmed that Charon was tidally locked with Pluto (just like our Moon is tidally locked with Earth, showing the same face). Marc Buie and his colleagues obtained HST NICMOS near-infrared spectrum in 1998 of both Pluto & Charon. Comparison of Pluto and Charon infrared spectra, taken in 1998 at the same epoch (near in time with each other), with HST NICMOS (near infrared camera and spectrometer aboard Hubble). A mystery. Spectra from Tethys, one of Saturn’s moons, has a remarkable agreement with Charon’s spectra, despite the bodies are of different temperatures and albedos? Will they have similar compositions when the New Horizons spacecraft flies by? The spectra is also not fit precisely with just water, so there is another unidentified species there. Predictions for New Horizons: Charon to have a heavily cratered surface with modest (subtle) albedo and color features. Expect to see differences between the Pluto and anti-Pluto hemispheres. Francesca DeMeo (MIT) talk was entitled “Near-Infrared Spectroscopic Measurements of Charon with the VLT.” She began her talk stating that TNOs (Trans-Neptunian Objects) can be characterized as (1) volatile-rich (lots of N2, CO, CH4), (2) volatile-transition, (3) water+ammonia rich (H2O, NH3), and (4) volatile-poor (neutral to very red colors, maybe some water ice). No TNOs, to date, show evidence for CO2. Her analog is to Charon is Orcus, a TNO with its own moon Vanth. Both are water and ammonia-rich bodies. 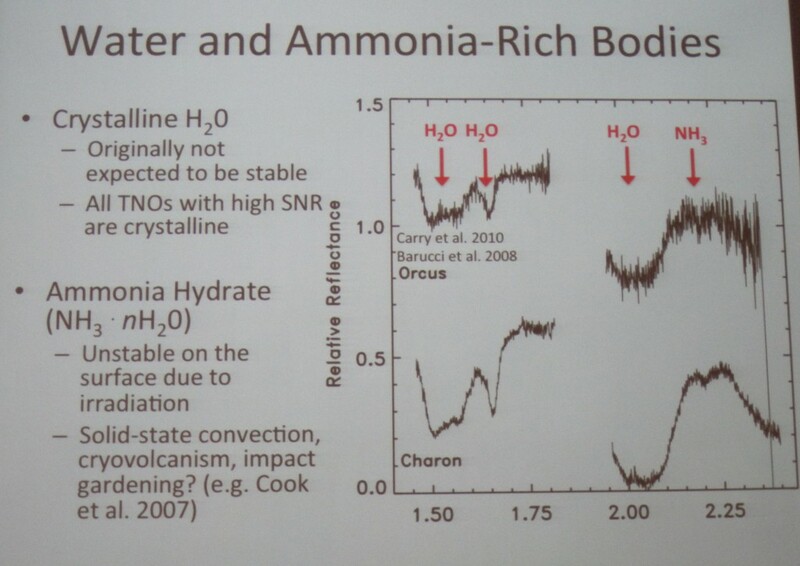 Comparison of two water and ammonia-rich bodies: the TNO Orcus and Pluto’s moon Charon. She observed Charon in 2005 using the VLT (8m telescope) with AO (adaptive optics), which separates Pluto. Her Pluto data is published in DeMeo et al 2010. Charon data was presented here in her talk and showed a comparison with Jason Cook’s data from 2007 and F. Merlin’s data from 2010, as they were looking at the same surface location. She is using the JPL Horizons longitude system. For a review of Trans Neptunian Objects, she recommends Mike Brown’s 2012 Review Paper http://adsabs.harvard.edu/abs/2012AREPS..40..467B. Gal Sarid (Harvard) followed with “Masking Surface Water Ice Features on Small Distant Bodies.” Minor (icy) bodies (TNOS, Centaurs, comets) are a diverse population with varied size, composition and structure. Their surface compositions show evidence for water ice and other volatile species. They are understood to be remnants of a larger population of planetesimals. He stepped us though his thermal and physical model of a radius=1200km object to reveal the possible insides of these minor icy bodies. Observationally this could be tested by inspecting impact crater that could eject subsurface material. From his computations he varies the ratio of carbon (dust) to water ice to give predictions for water band depth. When he compares the colors of the computed spectra they match very ice-rich TNO bodies, but his work reveals questions to explain the B-R colors. The models may need more other ices (methane, methanol). Reggie Hudson (NASA GSFC), a laboratory spectroscopist, presented “Three New Studies of the Spectra and Chemistry of Pluto Ices.” At NASA Goddard, they have equipment to test ices with their vacuum-UV (vacuum-ultraviolet). He showed 120-200 nm results of N2 + CH4 at 10 K. A second study was to measure CH4 ice in the infrared. CH4 has three phases: high temp crystalline T > 20.4 K, low temp crystalline T < 20.4 K, and amorphous CH4 forms around 10 K. He showed results for solid CH4 from 14-30 K over 2.17 to 2.56 microns and 7.58 to 7.81 microns. Their lab also has the ability to irradiate the samples, and when they have done so, certain phases recrystallize, but that is a function of temperature. Future work involves completing lab data of C2H2, CH4 and C2H6. Their lab website is http://science.gsfc.nasa.gov/691/cosmicice/. Brant Jones (University of Hawaii) discussed “Formation of High Mass Hydrocarbons of Kuiper Belt Objects.” They irradiate their ices with a laser and their measurement technique is a “Reflectron time-of-flight mass spectrometer.” They have identified 56 different hydrocarbons wit their highest mass C22Hm where 36 < m < 46. Future work is to investigate PAHs, look at “processed ices” and study different compositions, and study exact structures. Christopher Materese (NASA Ames) spoke on “Radiation Chemistry on Pluto: A Laboratory Approach.” Reporting on their laboratory work at NASA Ames, in their setup, they radiate their ices with ultraviolet (UV). Now for Pluto, the atmosphere will be opaque (not-transparent) to UV radiation. Secondary electrons generated by ion processes, however, drive the chemistry and their energy (keV-MeV) is similar to that provided by UV radiation. He presented NIR (near infrared) and MIR (mid-infrared) spectra of his irradiated ices. They have completed over 20 molecular components. They also have a GC-MS (gas chromatograph–mass spectrometer) to measure the masses of the molecules they create. The importance of laboratory work cannot be underestimated. It can help with predictions and equally important help with identification of molecules. Then once molecules and their abundances are determined, that can fold into more complicated models to look at volatile transport. Author Kimberly EnnicoPosted on July 26, 2013 July 31, 2013 Tags Charon, NASA, New Horizons, Pluto, SpectroscopyLeave a comment on Some insights into Charon and what roles laboratory work can play in New Horizons science. Pluto, the Orange Frosty, served with a dash of Nitrogen, a pinch of Methane, and smidgen of Carbon Monoxide. Dale Cruikshank (NASA Ames) set the stage with a spectra-rich presentation and gave an overview talk about the “Surface Compositions of Pluto and Charon.” Putting it in context, even 45 years after Pluto was discovered, we did not know much about Pluto only where it was in the sky and its rotation period. That rapidly changed when Dale and colleagues saw strong evidence for solid methane on Pluto in 1976 (Cruikshank, Pilcher, Morrison, 1976 Science 194, 835), Jim Christy discovered the companion moon Charon in 1978, and repeated observations were made of Pluto and Charon in the 1980s. Spectroscopy, the technique which spreads light into different wavelengths, has been a powerful diagnostic tool for the identification of molecular species, and therefore tells us the composition of the object. Low-resolution (R~100-500) spectra is sufficient to identify ice-solid features which are characterized by wide features, but higher resolution (R~1,000-10,000s) helps constrain models that determine temperature and also . New Horizons’ LEISA spectrometer covers the 1.25-2.5micron spectral band, with resolution R~240, and a mode of R~550 between 2.10-2.25 microns, making it ideal for identifying solid features. It’s proximity to Pluto during the July 2015 fly-by provides unprecedented spatial resolution. Compared to ground-based & Hubble spectral measurements which can only provide full-disk (~1500km/pix) measurements (because Pluto appears only in a few pixels), New Horizons’ LEISA will provide the true “first look” at the composition of Pluto at 6.0km/pix (global) with some patches at 2.7 km/pixel. Images in this blog entry show flux (measure of amount of light) or albedo (measure of reflectance) versus wavelength. Pluto’s near infrared spectrum (Grundy et al 2013) is rich in identifiable diagnostic solid materials, nitrogen (N2), methane (CH4) and carbon monoxide (CO). A comparison with Triton’s spectrum over the same wavelength is shown. Carbon dioxide (CO2) is suspiciously absent from Pluto’s atmosphere. Pluto’s mid-infrared (Protopapa et al 2008) show a series of methane bands. The gap at 4.2 microns is due to CO2 absorption from the Earth’s atmosphere. 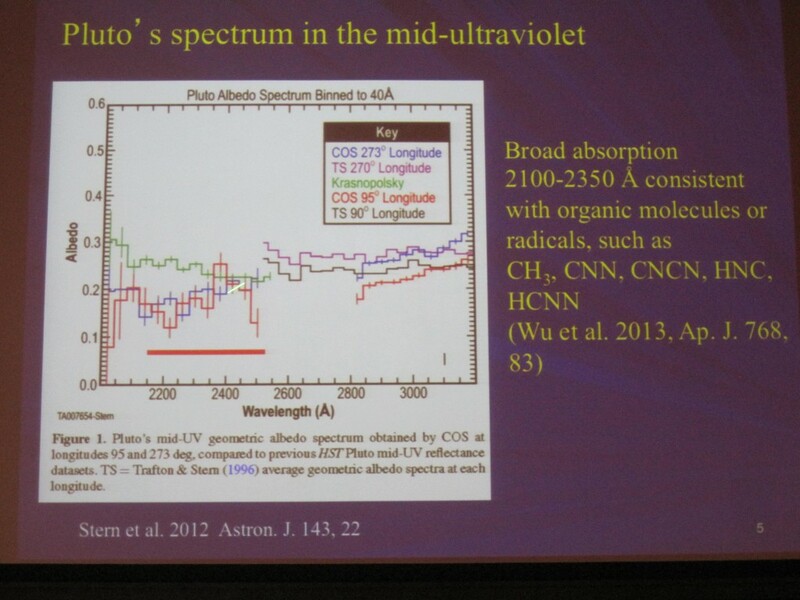 Pluto’s UV Spectrum from HST (Stern et al 2012) also indirectly supports the presence of organics. What do we know about the surface of Pluto? The major surface ice components are methane (CH4), nitrogen (N2) and carbon monoxide (CO). Some of the CH4 is pure, and some may be dissolved in N2. N2has been seen in two crystalline phases and the thickness should be at least a few centimeters. CO, may or may not be dissolved in N2. Ethene (C2H6) has also been detected (De Meo et al 2010). Suspected species, not yet detected, are Hydrogen Cyanide (HCN) and Carbon Dioxide (CO2). Predicted species include those from atmospheric chemistry, surface chemistry and other radicals. There are tantalizing hints that HCN and other nitriles (where you have a carbon with three bonds to a nitrogen molecule with the 4th bond to another atom or group) are potentially present (Protopapa et al 2008). 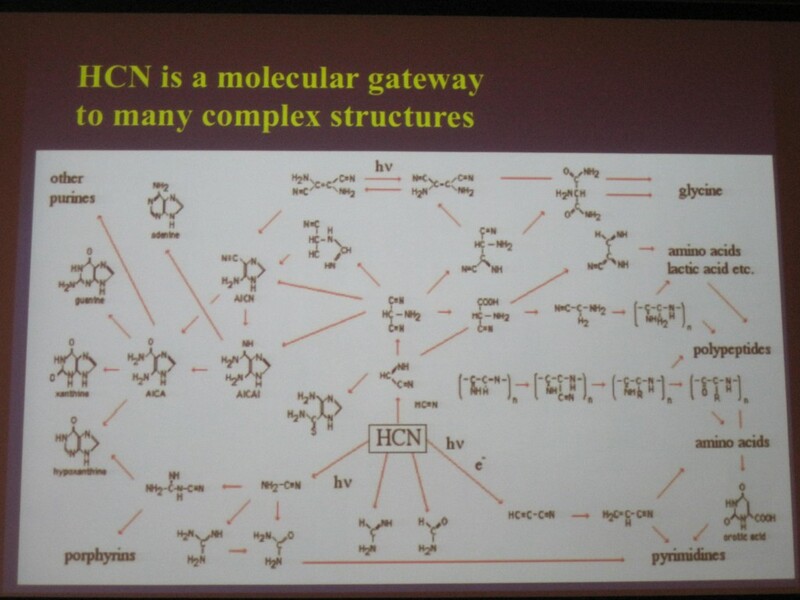 If confirmed, the presence of HCN opens up a series of chemistry pathways that enable Pluto to be a pretty complex place. HCN Chemistry pathways. HCN has not been confirmed to exist on Pluto, but suggested. If present, a whole set of possible chemistry becomes possible. These ices are white but Pluto has a colored surface. It’s actually quite red. The coloring on Pluto is hypothesized to be due to the presence of tholins, a complex organic molecule formed by ultraviolet irradiation of simple organic compounds. Geometric albedo (measure of reflectivity) of Pluto as a function of wavelength. See how red it looks? The Surface of Charon. Charon has an intriguing different kind of surface than Pluto. There is water (H2O) ice, perhaps crystalline ice, and ammonia (NH3) hydrate. But there are no CO, CO2, N2 or CH4, all which are present (or predicted) for Pluto. The nature and source of the ammonia is under debate. Could it come from below the surface and diffuse up or come from cryo-volcanism? Predictions for New Horizons. 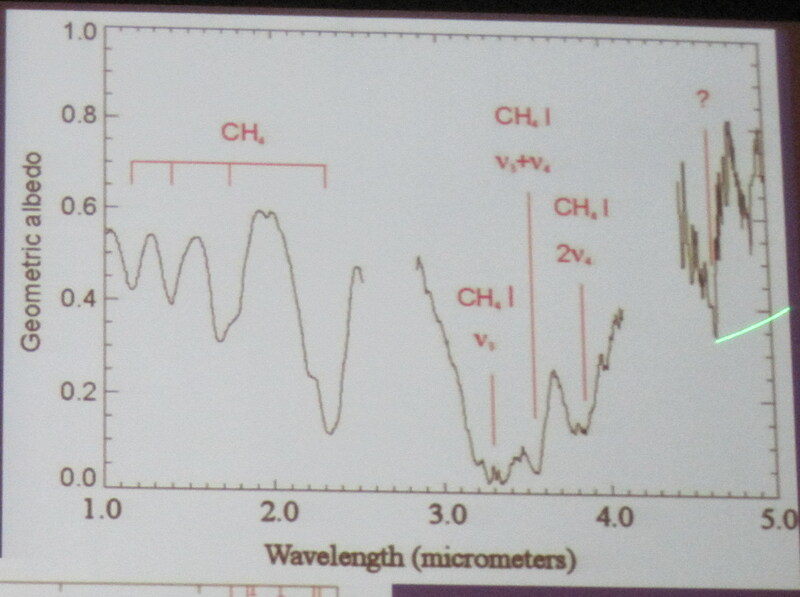 It will be hard to find HCN with LEISA due to its spectral resolution as there is a strong methane band nearby. Dale Cruikshank thinks it will be challenging as well to find alkenes. The mystery of the missing CO2 on Pluto remains. Carbon dioxide is seen on Triton (see above), whose spectra is very similar to Pluto. Dale Cruikshank looks to NASA’s JWST (James Webb Space Telescope, a 6.5 m diameter visible infrared space telescope) as the proper tool to make this detection. New Horizons LEISA instrument has probably to low a resolution to detect CO2 features around 2 microns. Will Grundy (Lowell Observatory) talked next on the “Distribution and Evolution of Pluto’s Volatile Ices from 0.8-2.4 micron spectra.” He reported on an IRTF (3.5 m telescope) SpeX (spectrometer) Pluto monitoring program spanning 10 years. The SpeX instrument provides R~1000 NIR spectroscopy over 0.8-2.4 microns. A recent paper on their findings can be found at http://adsabs.harvard.edu/abs/2013Icar..223..710G (Grundy et al 2013 Icarus 223, 710-721). They would obtain disk integrated hemisphere spectra because Pluto fills the SpeX slit, but during the course of this long monitoring they probed a variety of longitudes. Below are the longitudes on the Pluto that they probed. Each green point is the center of a particular pointing. This is overlaid on the best albedo (reflectance) vs. longitude surface map of Pluto from Marc Buie. In the coordinate system shown in this image, 0 deg longitude is facing Charon, with 180 deg longitude anti-Charon. Species abundance (measured as equivalent width) as a function of Pluto longitude. They have found that max CO amount is correlated with the 180 E region (anti-Charon), whereas largest amounts of CH4 is in the 270 E region. Equivalent width is a calculation of the depth of an absorption feature with respect to the absence of the feature at nearby wavelengths (continuum). When plotted against time, or in the case above, against spatial location (longitude location on Pluto), it can tell you something about the abundance variations of that molecular species. In summary, they have found that ice distributions seem heterogeneous (mottled, not smooth). 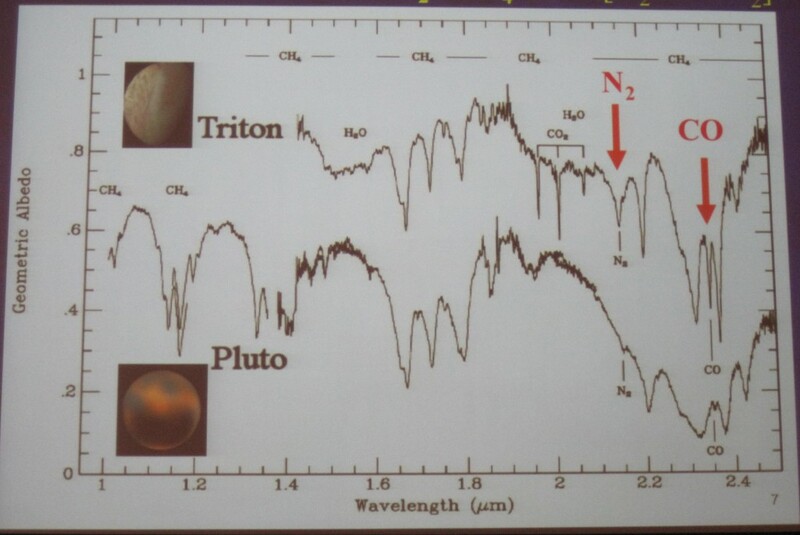 The NIR spectra show intriguing parallels between Pluto and Triton. From this 10 year period of observations they find that CH4 is increasing but CO and N2 is decreasing. They have also observed non-uniformities in both time and longitude. With a 10 year Earth program they have only observed ~5% of a Pluto year, so perhaps they will start seeing seasonal changes? 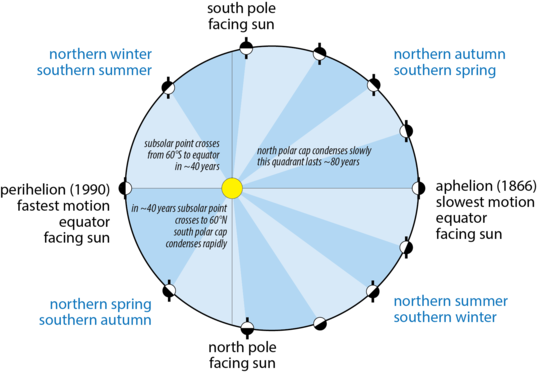 For a more lengthy discussion on suggested Pluto seasons, see this later blog post entry. Predictions for New Horizons. Will Grundy is eagerly awaiting New Horizons LEISA’s infrared spectral data. The instrument will have much higher spatial resolution than these “global hemisphere” maps with the SpeX instrument. The spacecraft’s closest approach geometry will be the anti-Charon hemisphere (180 deg E). This will be ideal for probing the strongest CO signatures. Noemi Pinilla-Alonso (University of Tennessee) provided a talk on “IRAC/Spitzer Photometry of the Pluto/Charon System.” With warm Spitzer/IRAC they took images in four bands probing the 3-5 micron range. Their intent was to look for the mid-infrared spectral signatures of N2, CO, CH4 ices and tholins, all which had discovered in the near-infrared (1-2.5 microns). They covered 8 longitudes with their observation set. Results. Their data confirms the surface heterogeneity that was measured by HST (Marc Buie). They also found their “slopes in color with wavelength” do have a longitude dependence and fall into two groups 160-288 deg Longitude and 234-110 deg Longitude. Both N2 and CO are also found to be strong at 180 deg Longitude at mid-IR wavelengths. This agrees with Will Grundy’s measurements at shorter wavelengths from the IRTF (see above, this blog entry). Jason Cook (SwRI) presented a talk on “Observations of Pluto’s Surface and Atmosphere at Low Resolution.” Intrigued by the ethane (C2H6) detection (De Meo et al 2010), he got the new idea to look for it this in old data he took in 2004 using the Gemini-N NIRI instrument, with R~700 (low resolution) spectroscopy. In his analysis, he had to include the C2H6 ice contribution to make a fit of ice abundances to the data. He was able to fit multiple methane bands and derive comparable amounts that agrees with other published methane detections at higher resolution. Implications for New Horizons. The big take-away is that low resolution spectra with high signal precision are capable of detecting Pluto’s atmosphere. New Horizons LEISA spectra has R~500 so this data example is an excellent comparative data set. He is eager to talk with others who have low-resolution spectra of Pluto or Charon to apply the new analysis techniques. Next, Emmanuel Lellouch (Observatoire de Paris, France) gave a talk on “Pluto’s Thermal LightCurves as seen by Herschel.” He ended his talk sharing tantalizing science on TNO temperatures from thermal measurements with Herschel and optical measurements used together to measure the diameter, albedo, and thermal inertia. They derive that TNOs have low thermal inertia (2.5 +/- 0.5 MKS), lower than Saturn’s satellites (5-20MKS), Pluto (20-30MKS), and Charon (10-20 MKS). More details can be found at http://meetingorganizer.copernicus.org/EPSC2012/EPSC2012-590-3.pdf. 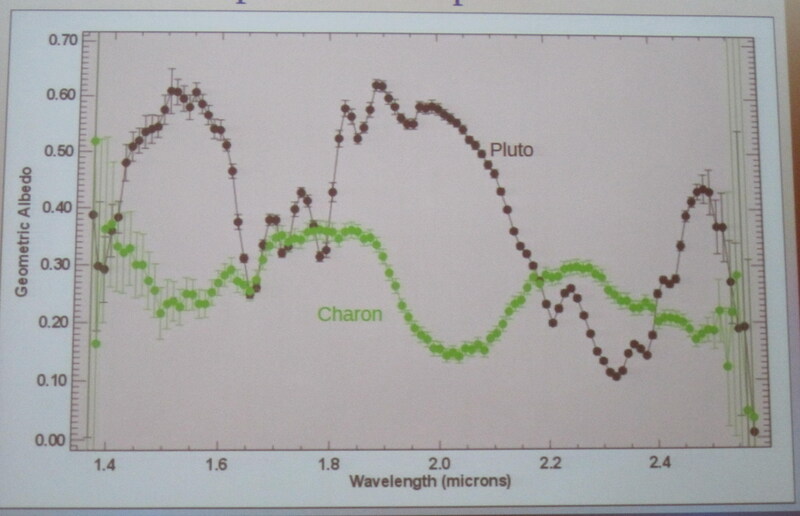 Moving further out beyond the Spitzer/Herschel far infrared, into the sub-millimeter range, Bryan Butler (NRAO) talked about “Observations of Pluto, Charon and other TNOs at long wavelengths.” As you go to longer wavelengths, you are less affected by solar reflection. You become dominated by the thermal emission from the body itself. But the emission at these wavelengths will be weak such that building highly sensitivity instruments is key, such as ALMA (in Chile) or updated VLA, called the EVLA (in New Mexico). They have been using ALMA and EVLA to observe Pluto and Charon in 2010-2012 and they had to remove the background contribution as Pluto had been moving through the galactic plane in this period. The path of Pluto is shown with the green line that appears to make loops. This is the path of Pluto projected against the sub-millimeter. The enhanced horizontal signal is strong submillimeter thermal emission from the plane of the Milky Way. This caused an undesired extra background signal that needed to be removed from data taken in the 2010-2012 time frame. What’s Next? 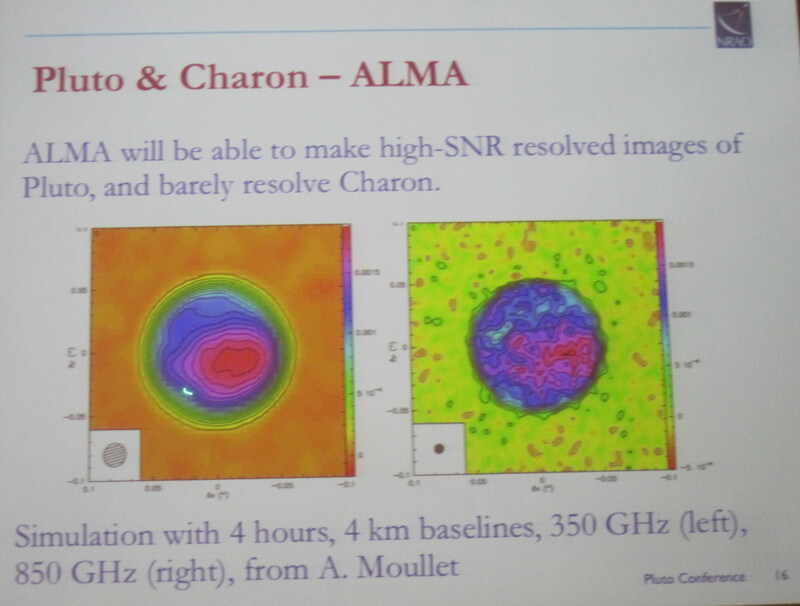 They wish to use ALMA to study Pluto & Charon and also attempt to detect Nix & Hydra, if they fall on the larger size. ALMA will be used to observe TNOs and will have the capability to resolve the largest TNOs like Eris (size ~2400 km diameter). They predict they can make high-SNR images of Pluto, but barely resolve Charon within a short observation time. To get high-SNR images of Charon would take more observatory time than they think would be awarded for a single object. 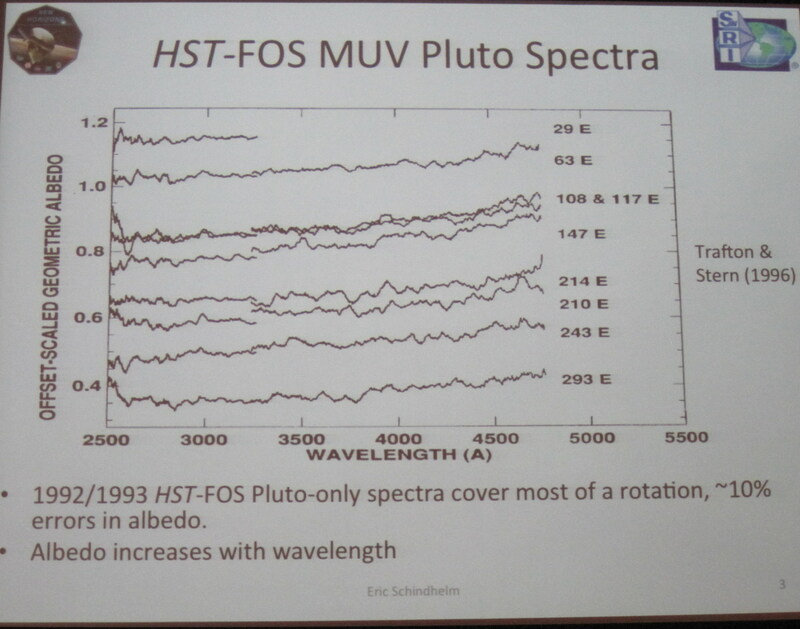 Switching away from the infrared and sub-millimeter and moving back to the ultraviolet Eric Schindhelm (SwRI) gave the final talk in this session entitled “FUV Studies of Pluto and its Satellites: From IUE to New Horizons.” IUE took the first UV spectra of Pluto in 1987-1988. This was confirmed with HST using the FOS (Faint Object Spectrograph) instrument in 1992. After 17 years, the HST COS (Cosmic Origins Spectrograph) instrument was used to observe two different longitudes, and they found some differences between the two data sets. The COS data indicated an absorption feature at 2000-2500 Angstroms (see Dale Cruikshank talk summary above), and it was suggested this is a hydrocarbon creating this feature. Eric Schindhelm next described New Horizon’s Alice instrument measurements and predictions for the Pluto and satellites during the New Horizons fly-by. He also summarized that more lab H2O, NH3 and CO2 ice FUV reflectance spectra is needed for interpretation of these data sets. Predictions for New Horizons. Pluto’s UV reflectance spectra will be limited due to faint signal and atmosphere absorption. Nix and Hydra will be barely detectable in FUV. Charon’s albedo for wavelength longer than 1200 angstroms should be detectable and they expect to get albedo, color and composition. They also expect to distinguish between different mixing ratios of the ices (ratios of H2O to NH3, H2O to CO2, etc.) with the UV spectra obtained by New Horizons. Although the predictions for detecting Pluto’s surface composition in the UV with New Horizons’ Alice instrument are expected to be limited, the Alice instrument will also be measuring Pluto Atmosphere (and searching for an atmosphere around Charon), which is its main purpose and directly addresses a prime Group 1 science goal. Author Kimberly EnnicoPosted on July 25, 2013 August 1, 2013 Tags ALMA, Charon, Herschel, IRTF, JWST, NASA, New Horizons, Pluto, Spectroscopy, SpitzerLeave a comment on Pluto, the Orange Frosty, served with a dash of Nitrogen, a pinch of Methane, and smidgen of Carbon Monoxide. Playing Marbles at Pluto. Looking at the Dynamic Dust Environment. Generators, Sweepers, and Sweet-Spots. 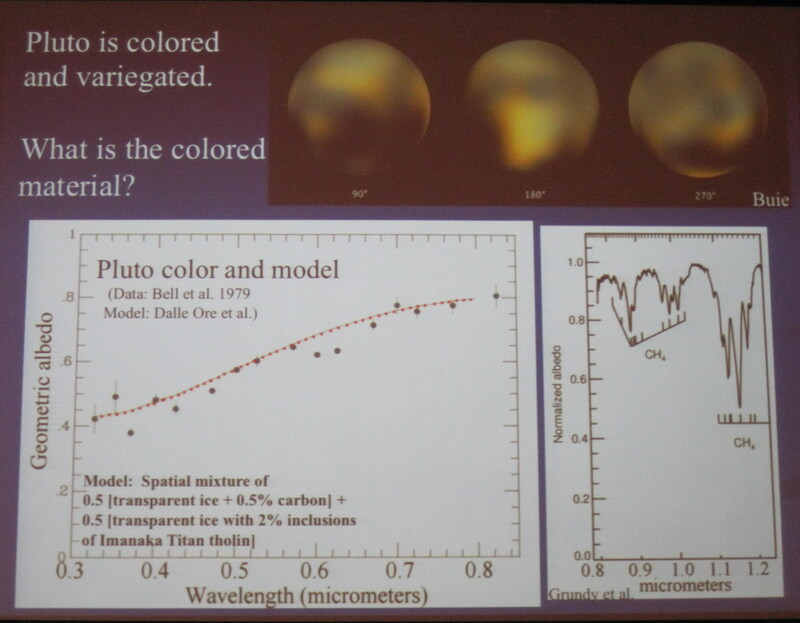 From the July 24, 2013 morning session at the Pluto Science Conference. 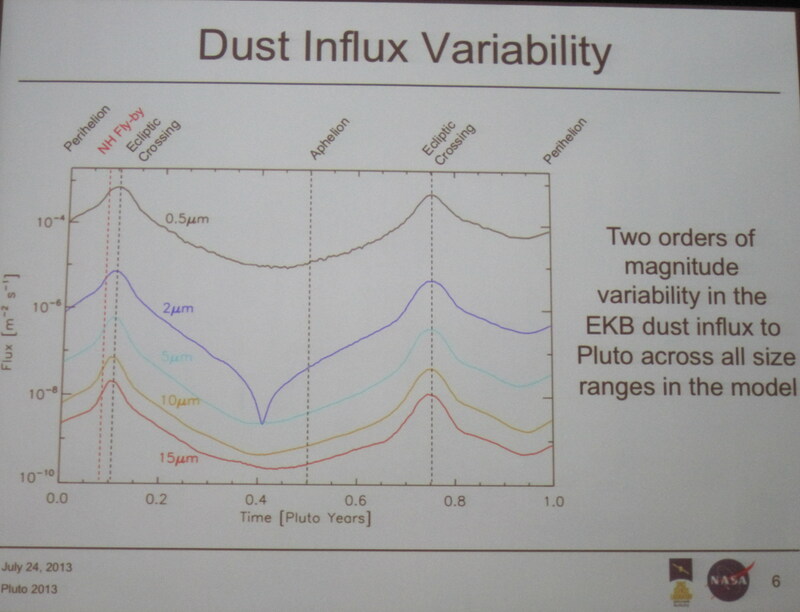 Simon Porter (Lowell Observatory) began this morning’s session with “Ejecta Transfer within the Pluto System.” He asked, “Where does the short lived dust go?” Having small satellites is not unusual in the solar system. Both Jupiter & Saturn have low number-density rings formed from short-lived dust particles ejected from small satellites. Their Hypothesis: Dust ejected from the small satellites is swept up by Pluto and Charon. Their Experiment: Simulate dust trajectories in a computer (N-body computation) starting randomly in the system (but constrained within the orbits of the small satellites) and map where they impact Pluto & Charon. Repeat this 10,000 times for a combination of parameters. Their Results: Dust particles do hit all the bodies in the Pluto System. For the Charon impacts, smaller particles survive longer, and those that hit Charon tend to have speeds around 50 m/s (like fastball pitcher). If a particle were to hit Pluto, it would be happen with speeds in the 50-200 m/s range and occur much quicker (due to the fact that Pluto has a larger gravity mass than Charon). They found that lower speed particles would hit the Pluto’s trailing side, whereas the higher speed particles hit the Pluto’s leading side. They also found a slight northern preference for smaller particles due to radiation pressure. And they made an intriguing observation that the impacts they computed correlate well to bright albedo areas (high reflectivity) on the Pluto surface. Coincidence? Implications for New Horizons. New Horizons will provide datasets from the Student Dust Counter instrument, plus updated albedo maps from image data, to test their computational model. David Kaufman (SwRI) next talked about “Dynamical Simulations of the Debris Disk Dust Environment of the Pluto System.” He was interested in modeling where debris dust would exist in the Pluto System. The motivation was to evaluate the probability of whether New Horizons would encounter a large enough dust particle that could be catastrophic for the spacecraft. He described the dynamics: the Pluto System can be approximated by a “circular restricted three-body (Pluto-Charon-particle) problem,” but it’s far from simply three bodies. There are features such as the Charon Instability Strip, where the moon Charon sweeps away material. The Lagrange points are unstable. And the outer moon can significantly perturb (change) trajectories that cross their orbits. He mentioned that “unusual type orbits” can be sustained by the unique gravity and motion characteristics of the Pluto System. He’s done numerical simulations following the particles, governed by physics principles for the system, over a time period of 500 years, and derived that the debris disk is an expended three-dimensional and stable. The inner debris disk recreated the instability strip. Silvia Giuliatti Winter (UNESP, Brazil) talked about “The Dynamics of Dust Particles in the Pluto-Charon System.” She is interested in the orbital evolution of small particles ejected form the surface of Nix and Hydra and what happens to them when dust particles from interplanetary meteoroids impact these satellites. The goal is to place constraints on predictions for a ring in the Pluto System. They model 1 micron and 5-10 micron “dust particles” and track where they travel. Conclusions: Particles released from the surfaces of Nix and Hydra temporarily form a ring. Collisions with the massive bodies remove 30% of the 1micron size particles in 1 year. The ring that was formed is very faint (optical depth tau=4×10-11). Implications for New Horizons: For such a faint disk, it will be a challenge for New Horizons to detect. However, if there is forward scattering it could be bright enough to be detected. (The models provided did not include a phase function, that is, a geometric indication of where the sun-light could illuminate the particles). What’s optical depth? Optical depth is a measure of transparency. If the optical depth is large (tau >> 1), we say the region is optically thick — light is readily absorbed. If the optical depth is small (tau << 1), the region is optically thin, and light passes through easily. Othon Winter (UNESP Brazil) spoke about “On the Relevance of the Sailboat Island for the New Horizons Mission.” In investigating where particles would find stable orbits, their modeling predicted a region where there was a cluster of orbits characterized by high eccentricity (e= 0.2 to 0.8) and located around 0.6 Pluto-Charon semi-major axis (i.e. between Pluto and Charon). They nicknamed it “Sailboat Island’ because on a eccentricity vs. distance from Pluto plot it looked like a sailboat. This population of “stable orbits” had not been predicted from previous work. The figure above is taken from Giuliatti Winter et al 2010 where they describe a family orbits called S-type that are stable. The plots are in d vs. e. where d, on the x axis is the Pluto-centric semi-major axis (how far from the Pluto barycenter) and e, on the y axis is the eccentricity. The “white” areas are orbit solution that were found to be stable. Area ‘1’ is the “Sailboat Island” described in the talk. Left are prograde (inclination=0) orbits, right are retrograde (inclination=180 degrees) orbits. Example of a particular family of orbits from the “Sailboat Island” parameter space in the full-family of stable orbits. Implications for New Horizons: Opportunity for discovery to look for these objects in the Pluto-Charon system. Andrew Poppe (UC Berkeley) on “Interplanetary dust influx to the Pluto System: Implications for the Dusty Exosphere and Ring Production.” The three previous talks addressed what happened to particles in the Pluto system with time (i.e., their lifetime, where they impacted objects, what stable orbits they achieved). Here he asked, could the source of the dust come from interplanetary sources? For example, come from the Kuiper Belt being dragged into the Sun. Computation of the dust flux (in particles/m2/s) for Pluto over one Pluto orbit. The peaks are when Pluto crosses the ecliptic (expected). New Horizon’s July 2015 Pluto fly-by (shown by the red dashed line) will be close to an ecliptic crossing. Implications for Rings. They turn their “mass influx models” and do calculations on where rings could form. They predict optical depth tau < 10-7 (in backscatter). They are working to refine their models to include larger grains. Open questions. 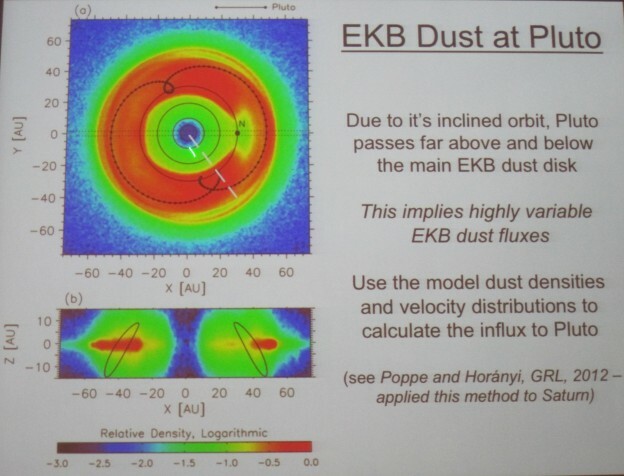 We still do not really have a good handle on the amount of dust generated by “the Kuiper Belt residents”. This is an active area of study. Henry Throop (SwRI at large) talked about putting “Limits on Pluto’s Ring System from the June 12, 2006, Stellar Occultation.” You can search for rings by direct limited (e.g., using HST) or using stellar occultations. Direct imaging is 2D but at coarse scales whereas stellar occultation give 1 D cuts at higher spatial resolution. He saw that although the June 12, 2006 occultation event was 61 seconds in duration, about 3 hours of data was taken over the entire event, so he started to look outside the main events in search for rings that would appear as shallower drops in the light curve. Three hours of data taken around the June 12, 2006 Pluto occultation even. They did not see any rings or debris with this data set. Looking back at the timing they realized that Nix was just missed by 1000 km or so. So had their been a cosmic coincidence that this occultation caught Nix, Nix would have been discovered 10 years earlier. Implications for New Horizons. This null results combined with other searchers for rings (e.g. recent HST observations) it put limits on ring detection, but this dataset is the only data set looking for rings at scales < 1500 km, the spatial resolution on HST. The New Horizons spacecraft on its fly-by through the Pluto system in July 2015 should detect a ring with its Student Dust Counter instrument, if such a ring exists. Author Kimberly EnnicoPosted on July 25, 2013 August 1, 2013 Tags Charon, NASA, New Horizons, Pluto, Small SatellitesLeave a comment on Playing Marbles at Pluto. Looking at the Dynamic Dust Environment. Generators, Sweepers, and Sweet-Spots. Small is the new big. Pluto’s family of small satellites sparks big discussions and new ideas. Continuing this series of talks from the Pluto Science Conference being held July 22-26, 2013 at the Johns Hopkins University Applied Physics Lab (APL) in Laurel, MD. This blog entry highlights a selection of talks on Small Satellites the afternoon of July 23rd. Hal Weaver (APL) gave us a hearty introduction to “Pluto’s Small Satellites.” The Pluto system is rich. It has five confirmed moons, Charon (1978), Nix (2005), Hydra (2005), Kerberos (2011, formerly know as P4) and Styx (2012, formerly known as P5). The Pluto system at a glance. Key top-level parameters of the satellites a=semimajor axis (from the Pluto-Charon barycenter/center of mass) in kilometers, P=orbital period in days. The moons appear to be in orbital resonances Hydra:Kerberos:Nix:Styx:Charon = 6:5:4:3:1. What about their albedo? Albedo is a measurement of a body’s reflectance, a reflection coefficient, where an albedo equal to 1 is “white” and an albedo equal to 0 is essentially “black” (e.g., dirty snowballs like comet nuclei have albedos ~0.04). It should be noted that albedo values can be functions of color (wavelength of light). We know that Pluto has an albedo ~0.5 and Charon has albedo ~0.35. Regolith exchange and dynamics agreements favor albedo ~0.35 for these small satellites, and assuming that density=1 (icy body). What are implications of these small satellite discoveries? These questions were posed: (1) Pluto system is highly compact and rich, so are there more satellites not yet discovered? (2) Was there a giant impact origin of Pluto System? (3) Could rings also form? (4) Could other large KBOs have multiple satellites? (We know Haumea has 2 companions. Could there be others?). What role will New Horizons bring? New Horizons will play a key role for small satellites, measuring their size and their shapes. Note: Additional occultation observations from Earth could reveal additional satellites and also provide measurements of their sizes, but not shapes. New Horizons best spatial resolution of the small satellites is: 0.46 km/pix (Nix), 1.14 km/pix (Hydra), 3.2 km/pix (Kerberos), and 3.2 km/pix (Styx). Best estimates right now for the sizes of these bodies, assuming albedo 0.35, are Hydra 50 km, Nix 40 km, Kerberos 10 km, Styx 4 km. That translates to roughly ~44, ~37, ~3, and ~1 pixels across Hydra, Nix, Kerberos, and Styx, respectively. At the time of Kerberos & Styx’ discovery, the New Horizons Mission Ops team had already designed the Pluto science sequence of observations to run aboard the spacecraft. In the spirit of exploration, the team had wisely reserved a few TBD (to be determined) observations that they now have placed observations of Kerberos and Styx that fit within the constraints. Firm flexibility at its finest. Scott Kenyon (Harvard SAO, by phone) “Formation of Pluto’s Low Mass Satellites.” He and his team looked at both the giant impact (Canup) and capture (Roskol) formation paths for Pluto and Charon. They model a debris disk where viscous diffusion expands the disk, collisions circularize the orbits, particles experience migration, and satellites eventually grow. They found that lower mask disks take longer to reach equilibrium, do produce more satellites, and also produce the smaller satellites. Calculations with large seed planetesimals produce less satellites. Calculations also do predict 1-km size objects in large orbits (orbits beyond Hydra) in a diffuse debris disk. For more details about their paper on the formation of Pluto’s low mass satellites is found here http://arxiv.org/abs/1303.0280. What role will New Horizons bring? New Horizons can test these predictions if they discover more satellites when they look at the Pluto system on approach and departure. Small satellites of planets: variety and dynamics role. We have a small selection of satellites of 20-100 km range (e.g. Metis, Amalthea, Thebe, Atlas, Prometheus, Pandora, Epimetheus, Janus, Hyperion, Phoebe and asteroids Mathilde, Eros, Ida). Best “comparatives” come from the Saturn family from amazing Cassini images, but these divided into two groups whether they are located within the ring arcs or not. Small satellites are irregular in shape, have high porosity (40-70% void space), weak (tidally fractured), crater morphology varies, regolith depths & distribution over surface, icy & rocky, and some have albedo markings. Saturn’s moons may be useful “comparatives” for describing Pluto’s small satellites. Predictions for New Horizons. Peter Thomas is excited to see New Horizons’ images of the small satellites. He predicts they will not look like egg-shaped. Thomas’ Best Guess: A Deimos/Hyperion hybrid morphology. KBOs and their satellites: variety and collision role. There are three multiple systems known in the Kuiper Belt: Pluto (6 components), Haumea (3 components) and 47171 1999 Tc36 (3 components). There are also 74 binary systems to date. The Pluto system is collisional. Unfortunately most of the KBO binaries have too low angular momentum to imply a collisional origin, but there is a subset of TNO binaries that could be a comparative set. Multiple collision systems in the Kuiper Belt could serve as possible analogs of the Pluto system. 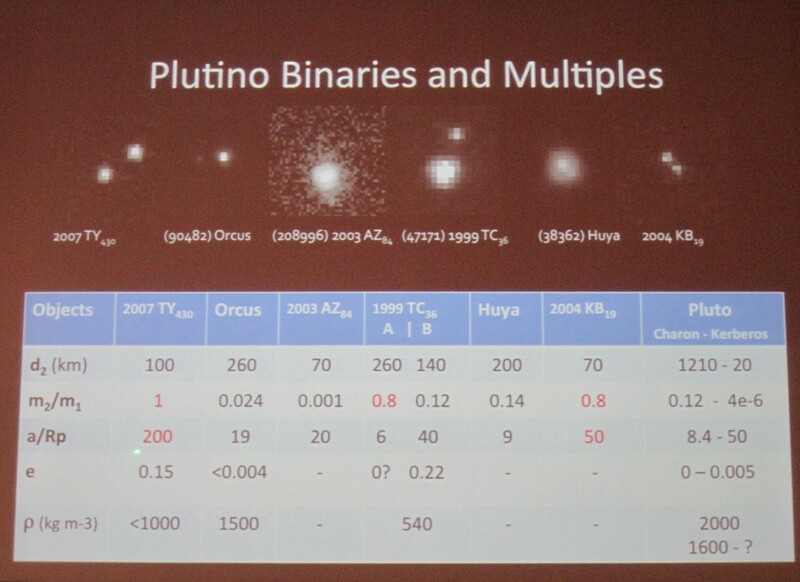 Plutino binaries (above) are also “comparatives” images for describing Pluto’s small satellites. Other comparative bodies, which may have collisional origin could be Quaoar, 1998 SM165, Salacia, and Eris. Predictions for New Horizons. New Horizons will tell us a lot about KBOs and test open theories about their formation and collisional history. Mark Showalter (SETI) on “Orbits and Physical Properties of Pluto’s Small Moons Kerberos (P4) and Styx (P5)” began with “Well, they are not your typical orbits.” The orbits of all the small satellites do wobble with a periodicity defined by Charon. Essentially the system acts like a “time-variable center gravity field.” There are nine orbital elements to fit (semi major axis, a; mean longitude at epoch, theta; eccentricity, e; longitude of pericenter at epoch, w; inclination I; longitude of ascending node at epoch, Omega; mean motion, n; pericenter precession rate dw/dt; nodal regression rate dOmega/dt.). 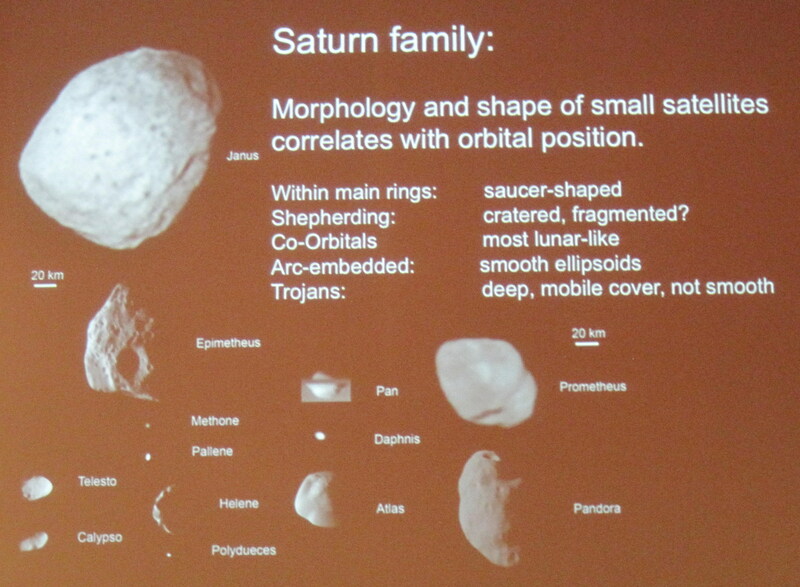 He provided updated parameters for the moons based on this work. Mark Showalter (SETI) next talked about his preliminary work on “Chaotic Rotation of Nix & Hydra.” He started the presentation with a light curves for Hydra & Nix made the 2010-2012 HST data sets. They do not follow the expected “double sinusoidal.” When plotting phase angle vs. time, Hydra and Nix do get brighter with lower phase angle and he used this information to normalize their light curves. He found that Nix & Hydra’s brightnesses do not correlate with their projected longitude on the sky. They are probably not in synchronous rotation. Also, he is not finding any single rotation period compatible with the data series he has. His premise is that Nix and Hydra are not following your typical rotation, and are very heavily influenced by the Charon-wobble. Best Guess: Hydra and Nix are in a state of “tumbling.” Bodies that not synchronous have no way to get to synchronous lock. Until now, Hyperion (one of Saturn’s moons) had been the only chaotic rotator. Not any more! It’s got company! 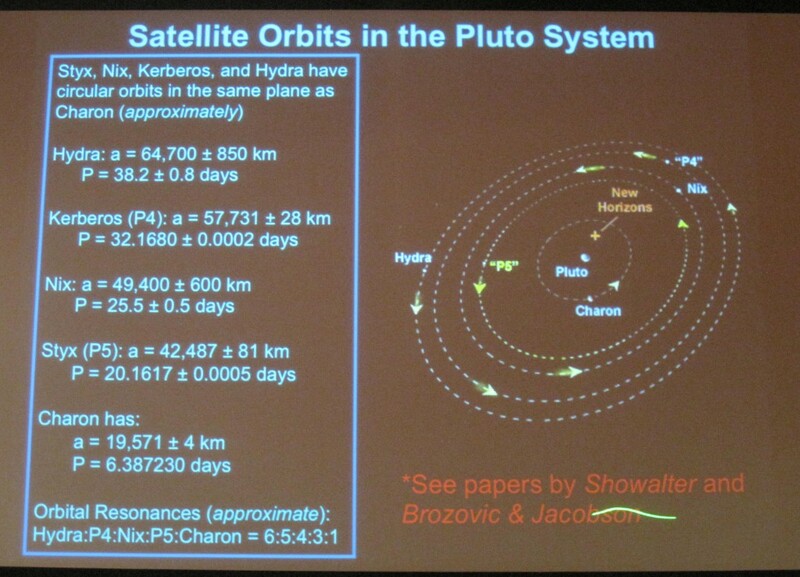 Marina Brozovic (JPL) spoke about “The Orbits and Masses of Pluto’s Satellites.” She used Pluto & Charon data from photographic plates (1980s), ground-based VLT AO data (1990-2006) and HST data (1990-2012); Nix and Hydra data from HST and VLT AO (2002-2012); and Kerberos and Styx data from HST (2010-2012) to derive orbital parameters for these bodies. They have created plu041 and plu042 ephemeris solutions (i.e. where all the satellites are in the system with time), the latter where they provide orbit predictions for the four smaller satellites. And, they have found interesting puzzles as they are working to find solutions for the new satellite masses. She presented orbital uncertainties at the time of the New Horizons encounter (July 14, 2015). 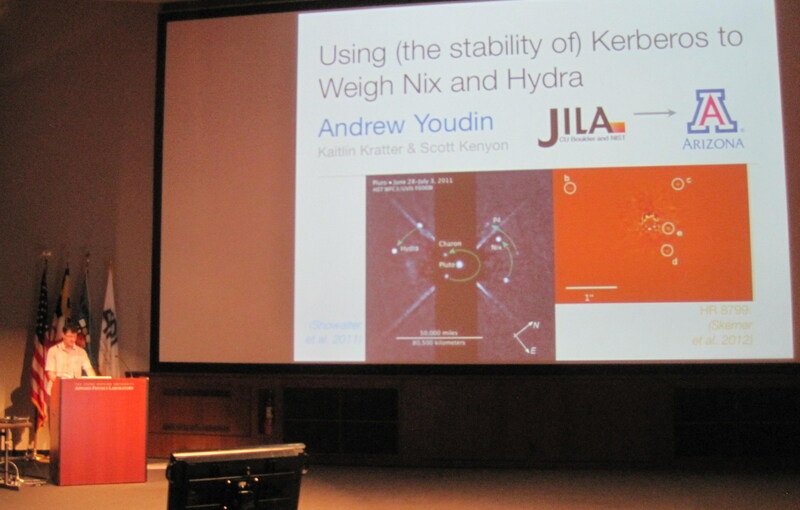 Andrew Youdin (JILA, CU Boulder) “Using (the stability of) Kerberos to Weigh Nix & Hydra.” He looked at what was done on the HR8799 (Skemer et al 2012) exoplanet system, where orbital stability technique was used, and applied it to the Pluto System. Kerberos/P4 does appear more unstable, but Styx/P5 may be more stable. To derive the necessary masses for orbit stability, when compared with measured brightnesses, means comet-like albedos are ruled out for small Pluto satellites. Instead, they would have high albedo, clean-icy surfaces. No dirty snowballs here. Andrew Youdin’s paper on using the P4 data to help constrain the masses of Nix and Hydra can be found here: http://arxiv.org/abs/1205.5273. Alan Stern (SwRI) on “Constraints on Satellites of Pluto Interior to Charon’s Orbit and Prospects for Detection by New Horizons.” Alan Stern asks, “Could there be moons inside Charon’s Orbit?” Charon is a big vacuum cleaner, and clears out a big swatch called the CIS, the Charon Instability Strip, clear down to 0.45-0.47 Pluto-Charon separation. Atmospheric drag by Pluto’s atmosphere could also add in the clearing-out the region. Charon’s eccentricity also constrains the problem. And when you combine the recent HST data detection limits, you only have a region from 0.2 to 0.45-0.47 Pluto-Charon separation (the outer edge of the CIS) where you could possibly have moons. What role will New Horizons bring? New Horizons will do a deep satellite search with the LORRI instrument at seven days prior to Pluto closest approach. This search will reach 6x fainter than current limits set by HST for Pluto companions, to detect objects down to ~1.2 km. If New Horizons does find satellites within Charon’s orbit this will provide new insights into satellite system origins. Charon has been a major player in the determining where debris in the Pluto system could remain stable. The Charon Instability Strip is a region between Pluto and Charon that is kept relatively free because of Charon’s gravity. Author Kimberly EnnicoPosted on July 25, 2013 August 1, 2013 Tags NASA, New Horizons, Pluto, Small SatellitesLeave a comment on Small is the new big. Pluto’s family of small satellites sparks big discussions and new ideas. How can you form Pluto and Charon? Let me just count the ways. On the afternoon July 23, 2013 at the Pluto Science Conference continued, we switched gears from atmospheres to small satellites. This blog entry is about the formation theories for Pluto and Charon. Hal Levison (SwRI) started the afternoon with a talk entitled “Unraveling the Early Dynamical Evolution of the Outer Solar system.” The “Nice Model” (Gomes, Levison, Morbidelli, Tsiganis) was devised to introduce possible models that could produce the Outer Solar System as we know it and preserve the Inner Solar System as we know it. The authors have been updating it with planets in resonances (Morbidelli et al 2007), put Pluto-objects in the disk (Levinson et al 2011), restricted the models to “save the Earth” by making sure Jupiter does not encounter an ice giant planet (Brasser et al 2009), and added a third ice giant (Nesvorny & Morbidelli 2011). To learn more information about the Nice Model, check out a good entry at http://en.wikipedia.org/wiki/Nice_model. The Nice model has told us a lot of good things. It predicts the right number and range or orbits for Jupiter and Saturn, predicts the right number and orbits for Trojans (things in 1:1 resonance with primary body) and reproduces the Late Heavy bombardment of Moon. However, it comes short of explaining the Kuiper Belt. So, what does this all mean for the Kuiper Belt? The Kuiper Belt is a rich structure. Observationally the sum of all the mass in the Kuiper Belt is <= 0.1 Mass_Earth. In order to get objects the size of Pluto to grow in the timescales of our Solar System, you need a lot more mass. So we need find this missing mass. Cold Classical Kuiper Belt Objects have orbits much like the planets; nearly circular, with an orbital eccentricity of less than 0.1, and with relatively low inclinations up to about 10° (they lie close to the plane of the Solar System rather than at an angle). They have characteristics similar to an undisturbed protoplanetary disk. Often the term ‘primordial’ is used when describing Cold Classicals. They tend to be in binaries and have “red” colors. He then ended his talk by sharing an recent update with his work on Outer Solar System modeling, hoping to explain high inclination Kuiper Belt Object formation, by looking at the formation of Jupiter and Saturn with and without a gas disk present. Jupiter and Saturn, when they are forming, are scattering objects outward. Then if there is a gas disk present, these objects get into what is known as Kozai resonances, where bodies exchange eccentricity for inclination. As the gas disperses, a population at high inclinations in the Kuiper Belt region (30-50 AU) are caught. In the models, if you vary the outside extent of the disk, you spread out the populations. However, this is not in agreement with our solar system (we don’t see those types of objects). Their conclusion is that you needed to have the gas disk truncated and this modification of the Nice Model can explain high inclination KBOs. Anders Johansen (Lund University, Sweden) in “Accretion of Kuiper Belt Objects” stepped us through the two models of major planet formation: Planetesimal (coagulation) vs. Pebble (steaming instability). He asked, could Pluto be formed by planetesimal accretion? This will require a cold disk of km-size planetesimals (Kenyon & Bromley 2012) where a key prediction of the planetesimal accretion model gives a differential size distribution that is in agreement with observations (i.e. lots of smaller objects). But, there is a problem this this approach since to make kilometer size objects beyond 20 AU as it would taken 100 Myr which is much longer than the life-time of the gas disk (Lambrechts & Johnansen, in prep). Thus, to make a Pluto-size (few 1000s km size) object would taker longer than the age of the Solar System. (Pluto orbit is 29 AU at closest to Sun to 49 AU, furthest from Sun). However adding streaming instability can speed up the planetesimal growth timeframe. Could Pluto have been formed by pebble accretion? Pebbles are accreted very efficiently by planetesimals (Lambrechts & Johnansen, 2012; Ormel & Jlahr 2010). This shapes the distribution (makes it steeper) and brings it more into agreement with asteroid and KBO populations. What new data will New Horizons shed? If data from New Horizons reveals the presence of Aluminum 26, this will imply a formation age for Pluto. 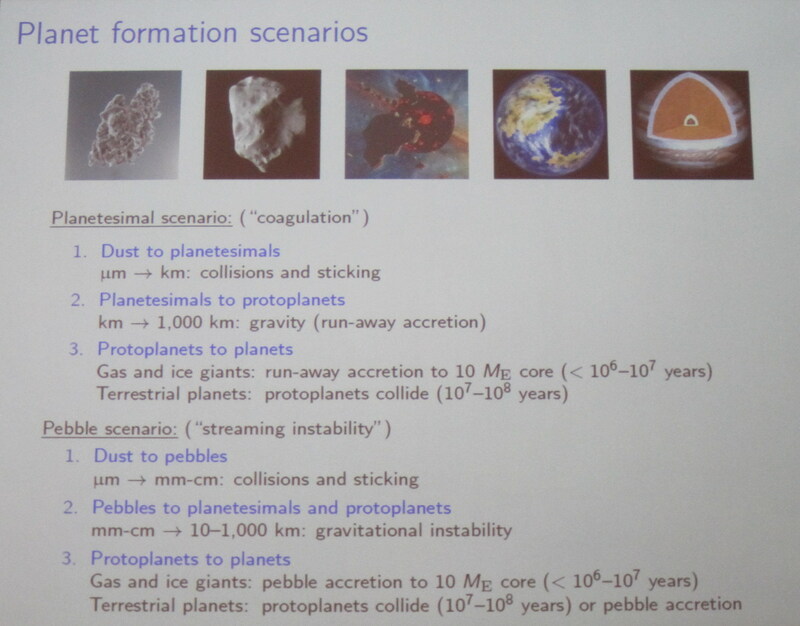 Formation time data can be fed back into planet-forming models, be they planetesimal or pebble accretion, and those models can be used to help explain other systems, such as observed proto-planetary disks or exoplanet systems around other stars. Robin Canup (SwRI) talked about the “Origin of Pluto’s Satellites.” Massive Charon and four very tiny outer moons make up Pluto’s satellites. All of these satellites are co-planar (they are moving in the same plane) and prograde with respect to Pluto’s rotation (they revolve about Pluto in the same direction as Pluto’s rotation). However, Pluto’s rotation is retrograde (in the motion opposite) to its orbit. It is thought that Charon was formed by a giant impact that could have preserved a lot of angular momentum in the system. Her models (Canup 2011) predict a grazing impact was needed to match the system angular momentum and produce a Charon-mass object. Achieving a Charon-mass object requires an extreme case, as most of them like to create a companion that is 6-8% of mass of the primary object. She also modeled cases where there is an undifferentiated impactor, and those systems can form “intact-moons.” In many scenarios, Charon-mass objects are created. And “the Charon that was created” forms entirely from impactor material. She postulates that this is the more probable explanation for Charon’s formation. The alternative theory for the formation of the smaller moons is by capture, but it’s rather very low probability. Plus that could imply far more irregular satellites and Pluto’s smaller moons are more regular. So this opens up the path for other theories. Collisional spreading? Collisional dampening? Preferential re-accretion? This is an active area of study. How New Horizons can help. By providing better constraints on masses and densities of Pluto & Charon, compositions of the tiny moons, any information about the differentiation shape of Pluto & Charon, and presence of distance satellites can better constrain these origin model. Author Kimberly EnnicoPosted on July 24, 2013 August 1, 2013 Tags Charon, NASA, New Horizons, Planet Formation, PlutoLeave a comment on How can you form Pluto and Charon? Let me just count the ways. More predictions about Pluto’s changing atmosphere. 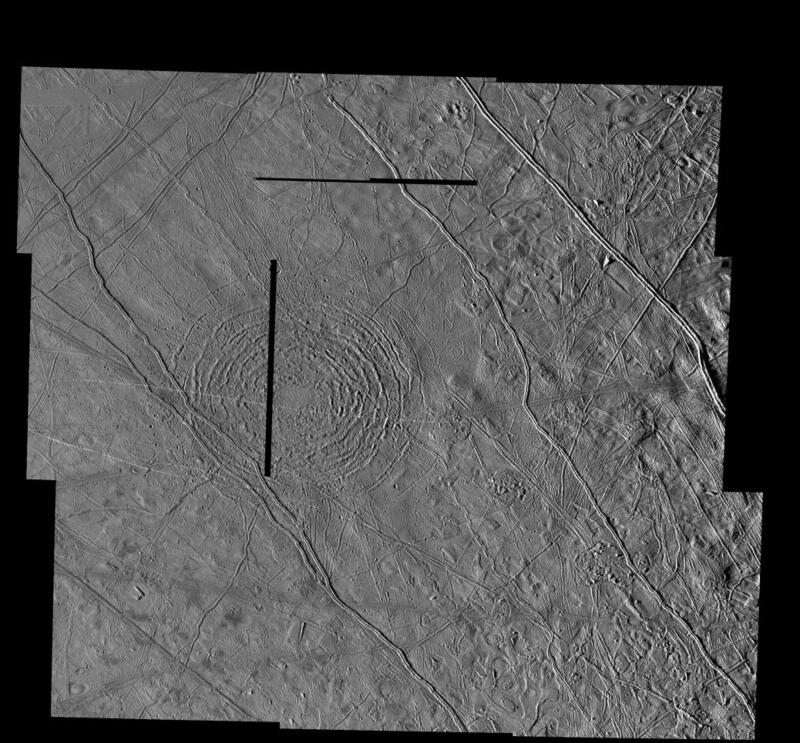 And Charon may have a few surprises of its own. Blog series continues. 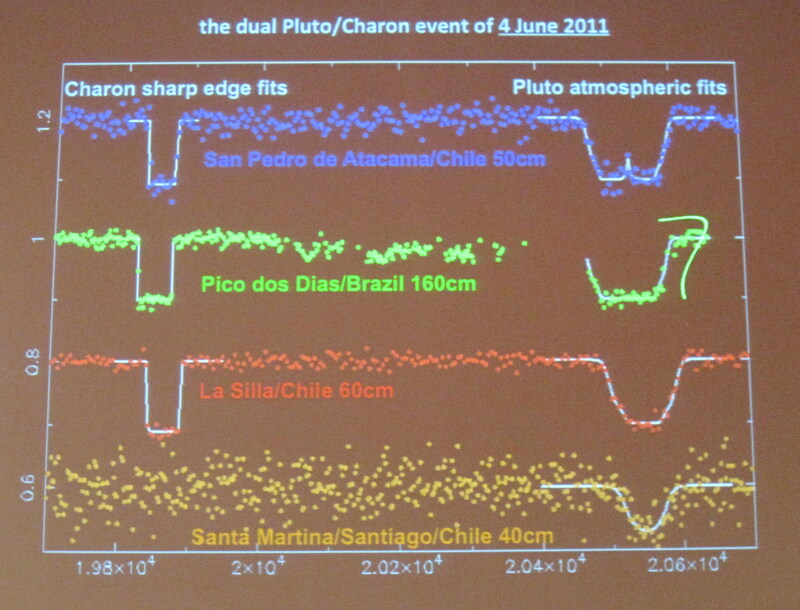 These are summaries of talks presented on July 23, 2013 at the Pluto Science Conference. The New Horizons mission will fly by the Pluto System on July 14, 2015, a place that has never been explored before by any other spacecraft. Many questions about the Pluto System remain unanswered. For more information about NASA’s intrepid explorer to the Solar Systems’ Third Zone go to http://pluto.jhuapl.edu/ and https://www.nasa.gov/mission_pages/newhorizons/main/index.html. We have come to understand that Pluto’s atmosphere is cold & tenuous, has a long radiative time constant, shows weak diurnal variations, indicates seasonal transport of volatiles with long term variations of atmospheric mass, and seems to be convectively stable. Current Pluto general circulation models (GCMs) predict smooth T(P) profiles reveal mean circulation and thermal structure. But there are problems. GCMs predictions (with these smooth T(P) profiles) are inconsistent with stellar occultation data, which imply much more complex T(P) profile. The other challenge to this mystery is that stellar occultations are spatially constrained (i.e., map across a particular lat/long swath of Pluto surface at the time of event). Are there waves in Pluto’s atmosphere? This is one proposition to explain the structures (spikes) seen in the Pluto occultation data. Tidal models they have built make predictions for large scale and small-scale structures. Also they can predict temperature profiles with altitude. Next steps are to apply this model to other occultation geometries. Richard French showed a comparison of a tidal model (Toigo et al 2010) against occultation data from an event on Aug 21, 2002 and they showed qualitative agreement. Richard French’s predictions for New Horizons fly-by: When New Horizons provides a true frost pattern, they can input this into their models and generate large-scale and small-scale structures for comparison with actual New Horizons atmosphere measurements. Their tidal models do generate regionally variable, latitude dependent thermal changes. If this is what New Horizons observers, their model can help constrain parameters. There was a dual Pluto & Charon occultation event on 4 June 2011. Pluto and Charon each pass in front of the star (at different times). Look at curve shapes. Charon’s curve sharply drops, indicative of no atmosphere, unlike Pluto’s curve, which has not-as-steep ingress/egress that indicates the presence of an atmosphere. Using the light curve data, Sicardy and his team use a temperature vs. altitude model to fit the light curve depth, width and ingress/egress slope. Then with the temperature, they can derive a pressure. He presented results from the most recent Pluto occultation that was observed May 4, 2013. Good data and good fit. Next were shown the derived pressure (at 1215km) for occultation events observed from 1988 to 2013. 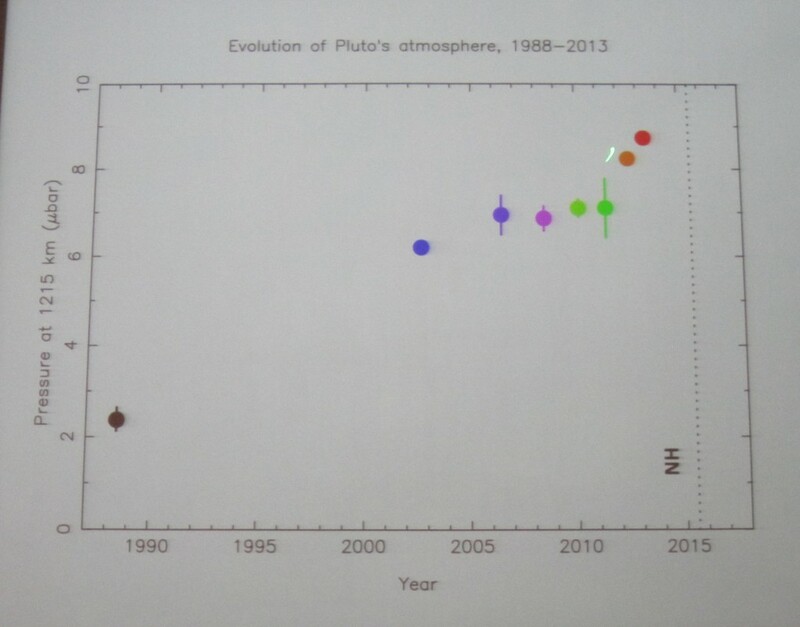 Occultation results show the Pluto atmosphere is increasing over the past few years. There is some notable evolution and implies a regular expansion. But a question from the audience stressed caution as we could be seeing just the northern pole facing the Sun with that contributing to the expansion but it could be a localized phenomena. Bruno Sicardy’s predictions for New Horizons fly-by: Atmosphere will be present for the fly-by. Michael Person (MIT) next described “Trends in Pluto’s Atmosphere From Stellar Occultations.” He started his talk with the advantages of occultation measurements: you get spatial resolution (~1 km at Pluto) with direct measurements of atmospheres (temperature, pressure, number profiles). MIT has collected data sets from 1988 through 2013. Their group tends to separate the upper vs. lower atmosphere when they fit their data. He next showed a light curve comparison over. Are we seeing a gradually decrease lower atmosphere slope? Is there a gradual lowering of the separation boundary? “Haze or No Haze? That is the question.” Best evidence of haze is from the occultation event of 2002, where there is a distinct change in brightness as a function of wavelength (Elliot et al 2003). Attempt to look for haze in the 2011 occultation event with SOFIA in three bands was not successful. The main question is why does the haze come and go, and what is causing it? What Mike Person is looking forward to: New Horizons will finally provide the size of Pluto! Knowing where the Pluto surface really is, or equivalently, the size of Pluto, is a key data point, as all these interpretations of occultation light curves and interpretations to atmosphere assumes a Pluto size. Alex Dias de Oliveira (Observatoire de Paris, France).“Pluto’s Atmosphere from Jul 18, 2012 stellar occultation.” This is his PhD work and he provided an updated status of the steps taken from prediction of the event, the observation data collected, various calibration items, and first attempts to invert the light curve to get a temperature profile. He observed this Pluto occultation event with the ESO VLT (8m telescope in Chile) with the NACO instrument in the H band (1.65 microns). Comparison with the June 12, 2006 AAT event showed that spikes seen in the light curves were repeated in the July 18, 2012 event he observed wit the VLT in Chile. Cathy Olkin (SwRI) presented results from “The May 4th, 2013 Stellar Occultation by Pluto and Implications for Pluto Atmosphere in 2015.” This was an event where Pluto passed in front of a R=14.4 mag star with a slow shadow velocity of 10.6 km/s. The event was observed from the southern hemisphere, from Cerro Tololo in Chile. Erika Barth (SwRI). “Is Methane Supersaturation Consistent with the Presence of Haze Particles in Pluto’s Atmosphere?” She asked the question: If you put haze particles into Pluto’s atmosphere how do they interact with the methane in Pluto’s atmosphere?” She developed a model to ingest haze particles into a supersaturated environment and this predicts the growth of clouds and condensation of methane. Then when methane condenses out, that reduces the amount of observable methane. Her model requires the existence of a troposphere (which we learned earlier in Emmanuel Lellouch’s talk today that there is no evidence for this, but its existence could explain some phenomena, some observed to date, other predicted) and also predicts a thick troposphere as well. She created a Pluto version of CARMA, the Community Aerosol and Radiation Model for Atmospheres. 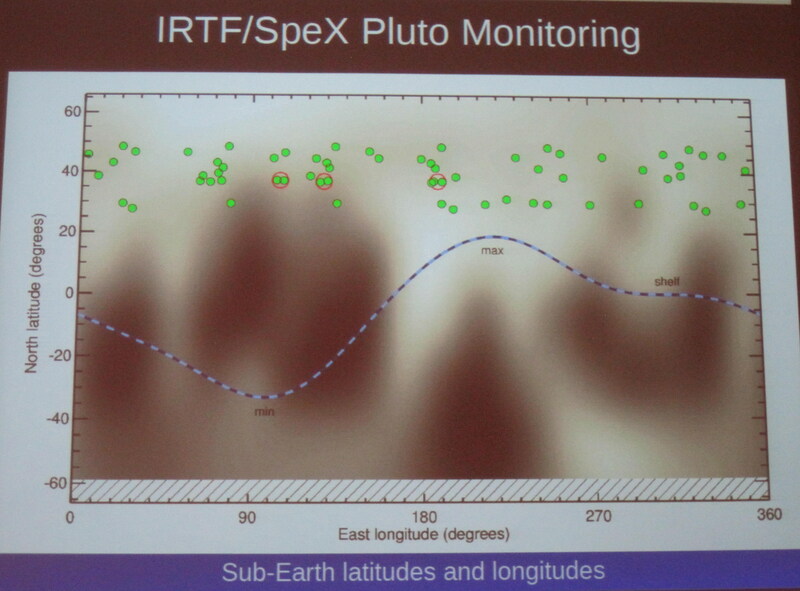 Jason Cook (SwRI) next spoke about his “Analysis of High Resolution Spectra of Pluto: A Search for Cold Gaseous Methane Layer, and Spatial Variation in Methane Column Abundance.” Occultations have told us that Pluto’s upper atmosphere (above 1195 km) is pretty warm (100 K). But 2.15 micron N2 ice measurements of Pluto’s surface tells us the surface is ~40 K. So this implies there needs to be a cold-layer in the atmosphere. To investigate a search for this “cold layer of air” they took NIR (near infrared) spectra with NIRSPEC on Keck with R=35,000 in 2011. They need to move to a two-temperature model to help constrain the observed data (i.e. measured methane line depths from the high-res NIR spectra), but the hot/cold ratio of the two temperatures is an unresolved topic (pun intended). They also took spectra of Pluto over several nights to probe the different longitudes of Pluto (Pluto has a rotational period of 6.4 days) and they got a fairly consistent number except near 180 deg longitude where gaseous CH4 was not easily detected. They would like more data to probe this temporal measurement. 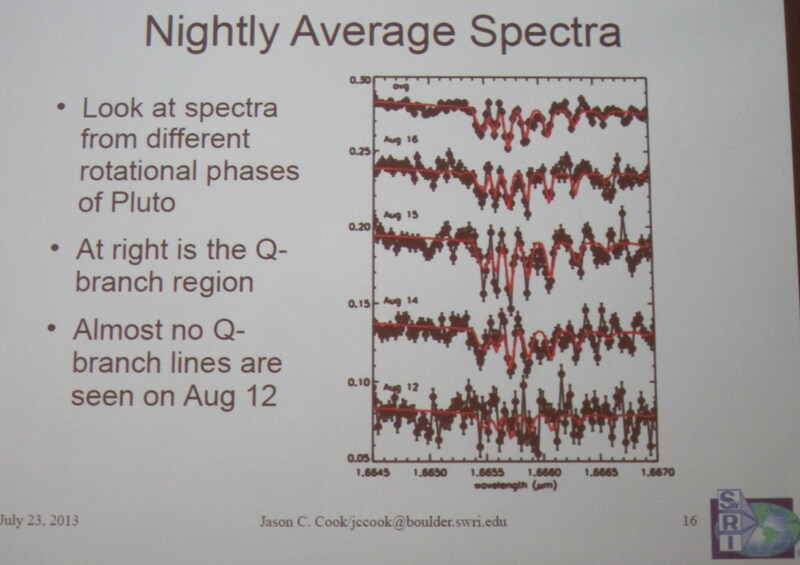 Selection of high-resolution NIR spectra of Pluto obtained over several days. This series probes a range of Pluto rotations and show how methane lines (Q-branch) vary. Eliot Young (SwRI) spoke about “Evidence for Recent Change in Pluto’s Haze Abundance.” Hazes have been observed on Titan (photolysis products from higher up in the atmosphere) and Triton (condensates from surface). The August 21, 2002 occultation showed evidence for haze (change in brightness with color, Elliot et al 2003), but 2007 (0.51 & 0.76 micron) and June & July 2011 occultation events in different bands (I & K bands) showed no change in color. Occultations can only probe down to a certain depth, so they are limited. We don’t really how close you got to the Pluto surface. If you have a special case where you can have a central flash or sets of flash spikes, you can derive more information. By applying a new technique on the 2007 Mt John light curves, he proposed they can determine amount of haze by evaluating the attenuation in those parts of the light curve. Central Flash Description: A central-flash occultation is visible when the observer is located near the center of the shadow path of the object. It is here where the atmosphere near the edges of the occulting body (for Pluto occultations, this is Pluto) refracts extra star light (from the background star) directly opposite from the star, forming a “brightening” in the middle of the deep light curve. 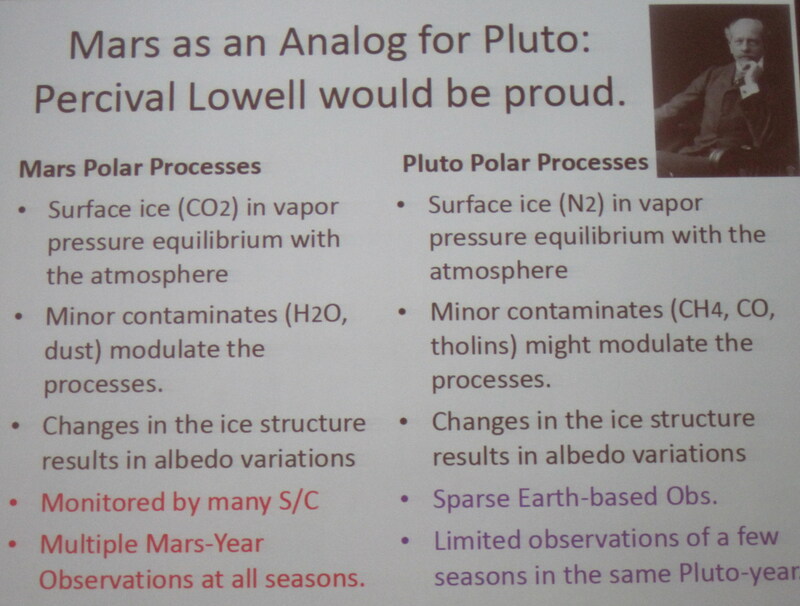 Mark Gurwell (Harvard CfA) provided a talk entitled “Atmosphere CO on Pluto: Limits from Millimeter-Wave Spectroscopy.” Carbon monoxide (CO) is expected based upon the presence as an ice on its surface. The first direct detection of CO was done in the NIR with the VLT (Lellouch et al 2011). Then JCMT (Greaves et al 2011) revealed a CO(2-1) line in the submillimeter, but this line had not been there a few years back, leaving a mystery. There is still mystery in fitting the CO abundance based on the measured submillimeter width and strength of this line. He did show that Pluto had been in the fore-ground of a galactic emission during the JCMT observations. He supposes that they had contamination. They did their own observations using the SMA sub-millimeter telescope multiple times and did not detect the CO(2-1) line in the spectra (they have upper limits). So he is excited about using the ALMA array that has 30-50x SMA sensitivity to really address the CO, nitriles and isotopes. And the final talk of the morning Atmosphere session just could not leave Charon out of it. 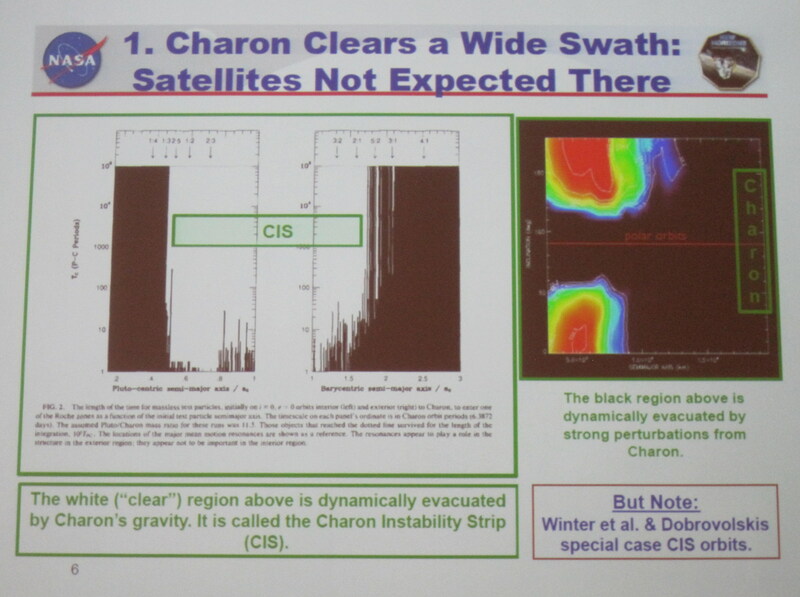 Alan Stern (SwRI) “Cometary Impact Produce Transient Atmospheres on Charon.” Most scientists have come to accept that Charon does not have an atmosphere (see earlier posting in Bruno Sicardy’s talk showing the dual occultation event for Pluto and Charon in Jun 2011.) But he postulates what about impacts? Coming from the Kuiper Belt, impactors (assuming cometary-level amounts of volatiles) could provide volatiles to the surface to Charon and therefore creating a “nanobar” atmosphere on Charon. Similar events could lead to atmospheres on Kuiper Belt objects. Their modeling (Trafton & Stern 2008) predicts presence of N2, CO, Ar, CH4, with CO dominating after impacts, and N2 being the dominate species (in terms of amount). Predictions for New Horizons. Duty cycle would be short lived so it will be rare if New Horizons catches this event. However, with smaller impactor sizes, there could be a possibility that those events could have occurred within the “photoionization time” (before the molecule breaks down or escapes) or resulting implanted molecules by the time New Horizons gets there. Alan Stern coyly stated, “could be as much as a 25% chance” to see an nano-bar atmosphere on Charon. A good question regarding surface volatiles that are revealed by impacts got the crowd excited. After all, when you describe an atmosphere you can categorize things as sources and sinks. Sources bring material to the system and here they could be not only the KBO impactor but also the materials that are revealed from the impacted-body after the impact. On July 14, 2015 New Horizons will be doing a very sensitive experiment via the observations of the Charon occultation (Charon passing in front of our Sun as viewed from New Horizons). Charon may indeed hold a few surprises of her own! Author Kimberly EnnicoPosted on July 24, 2013 August 1, 2013 Tags ALMA, Atmospheres, Charon, NASA, New Horizons, Pluto4 Comments on More predictions about Pluto’s changing atmosphere. And Charon may have a few surprises of its own. Pluto’s uppermost atmosphere. How big is it? This is a blog series about talks presented that Pluto Science Conference, held July 22-26, 2013 in Laurel, MD. 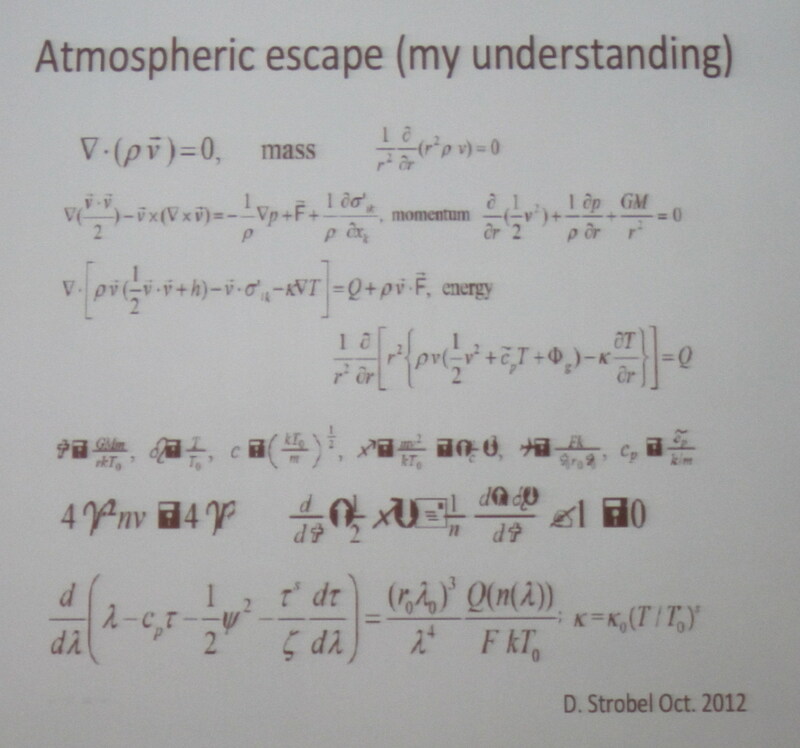 But first, what hydrodynamic escape discussion could be complete without a few equations…. Yes, this is what an atmospheric modeler solves for. He/she solves numerous energy-balance, energy-transport, etc. equations to derive properties for making an atmosphere. The Hydrodynamic escape rate is a key output from these numerical models for Pluto, with predictions in the range of 1.5-6.7 x 1027 particles/s. The basic problem with computing hydrodynamic escape is due to the presence of a gravity well that these molecules need to escape from. Essentially, you need an additional energy input (such as thermal) to drive the escape process. Some other key terminology: “The exosphere is a thin, atmosphere-like volume surrounding a planetary body where molecules are gravitationally bound to that body, but where the density is too low for them to behave as a gas by colliding with each other.” (Wikipedia) It is the uppermost layer where the atmosphere thins out and merges with interplanetary space. The exobase is the lower boundary of the exosphere, defined as the altitude at which the atmosphere becomes collisionless. Atmospheres can lose atoms from stratosphere, especially low-mass ones, because they exceed the escape velocity (Ve= (2GM/ R)½). This is known as (Jeans escape or Thermal Escape). The Jeans parameter (lambda) is a measure of how efficient the loss mechanism is. Larger lambda values implies less loss (smaller escape rates). Models by different groups predict Pluto’s exobase between 5 and 10 Pluto radii. Assuming Pluto radius of 1200 km, Pluto’s exobase is in the 6000-12,000 km range. New Horizons’ nominal trajectory will bring the spacecraft to within ~10,000 km of Pluto’s surface and ignoring the slight fact that there are uncertainties in deriving Pluto’s size in the 20-100 km range and ignoring whether you determine a planet size by including or excluding the atmosphere, there is a possibility New Horizons could be flying through Pluto’s exosphere. Such an extended atmosphere could be affected by Charon and could affect Pluto’s interaction with the solar wind at the New Horizon encounter, as measured by New Horizons instruments PEPSSI and SWAP. (For more talk summaries about solar wind, see later blog entry). A plot of temperature in Kelvin (x axis) vs. altitude in km (y axis) is a typical output of this type of model. 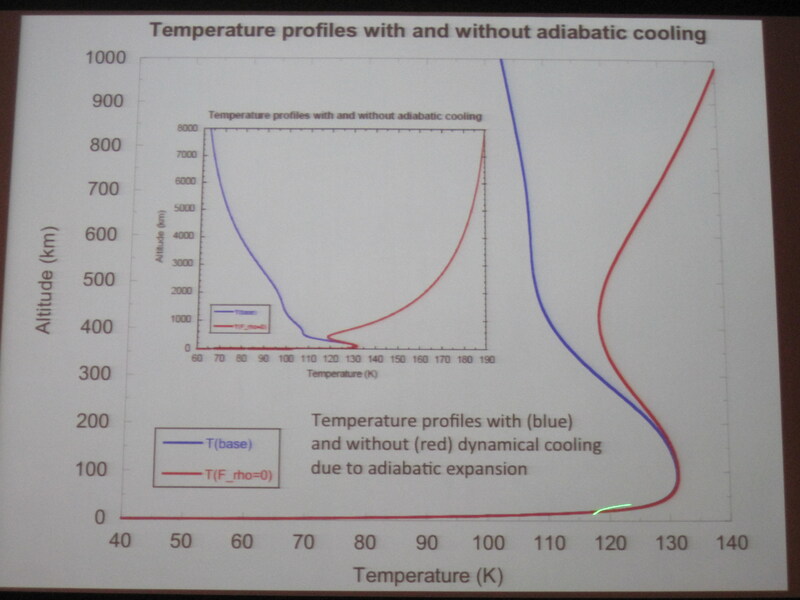 Below is a particular plot shows the effect of adiabatic cooling, which Darrel Strobel stressed, is a key component that cannot be ignored. Another key output from these models is the computation of number density (N2 molecules/cm2/s) as a function of altitude. Temperature profile with altitude for models with (blue) and without (red) adiabatic cooling. The surface is at 40 K (which is from observation evidence) and upper atmosphere temperatures are in the 100s of Kelvin (supported by NIR spectral observations of methane). The two models predict wildly different temperatures at high altitudes depending on whether cooling is occurring. Darrel Strobel’s predictions for New Horizons fly-by: Escape rate 3.5×1027 N2/s, exobase at 8 Rpluto ~9600 km, Jeans Parameter Lambda ~ 5. Author Kimberly EnnicoPosted on July 24, 2013 August 1, 2013 Tags Atmospheres, NASA, New Horizons, PlutoLeave a comment on Pluto’s uppermost atmosphere. How big is it?